For anyone that suffers from pain in their hand, wrist or arm from RSI, using a mouse for extended periods can be an excruciating experience. Our hands aren’t meant to be kept in a horizontal position for so long without break, and years of mouse use can cause significant problems. That’s why we’ve seen alternative ergonomic mice designs, many of which allow the mouse to be used in an angled or even completely vertical position. This reduces pressure and pain, allowing computer users to work, play games or surf the web in comfort. However, not all positions are comfortable for all people, and it can be hard to guess which position you’ll like best before actually trying it. Even if you find a position that works, moving from one fixed position to another may not be great for your long-term health. 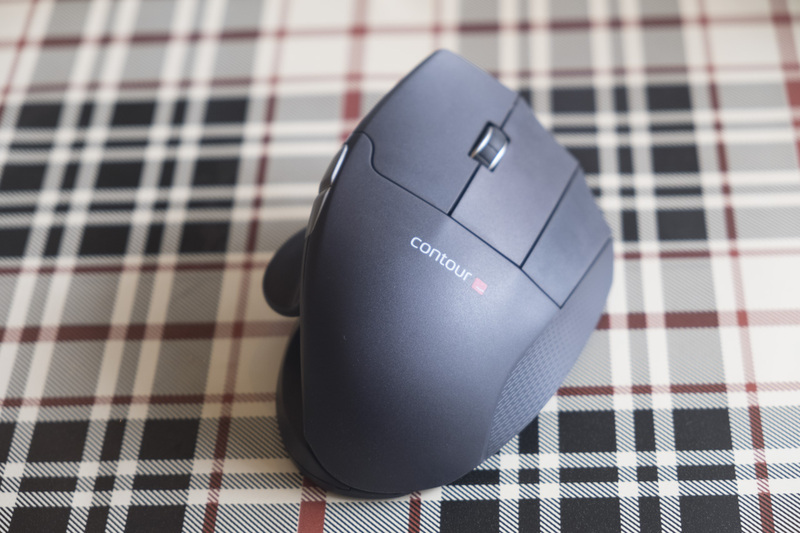 The subject of today’s review solves these problems by offering a full range of angles, allowing you to use your mouse at nearly the same angle as a traditional mouse, almost vertical or any angle in between. 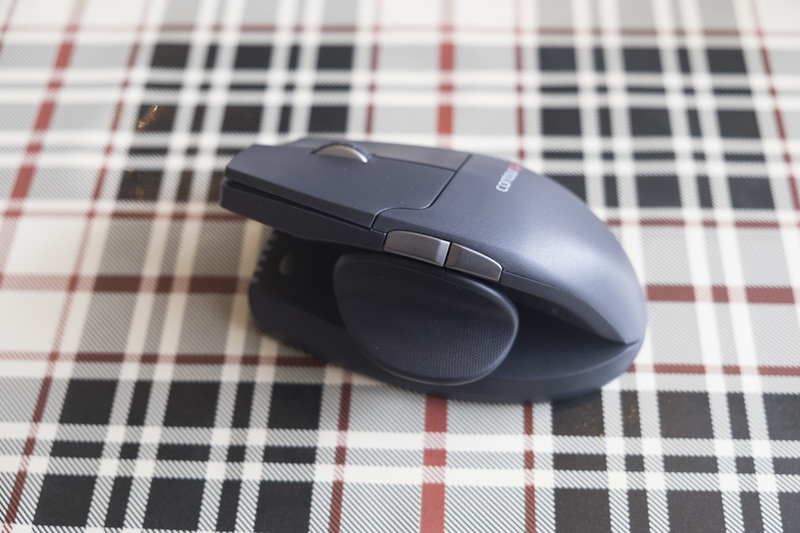 It’s called the Contour Unimouse, and we’ve been using it for the past week. Let’s take a closer look in our full review! 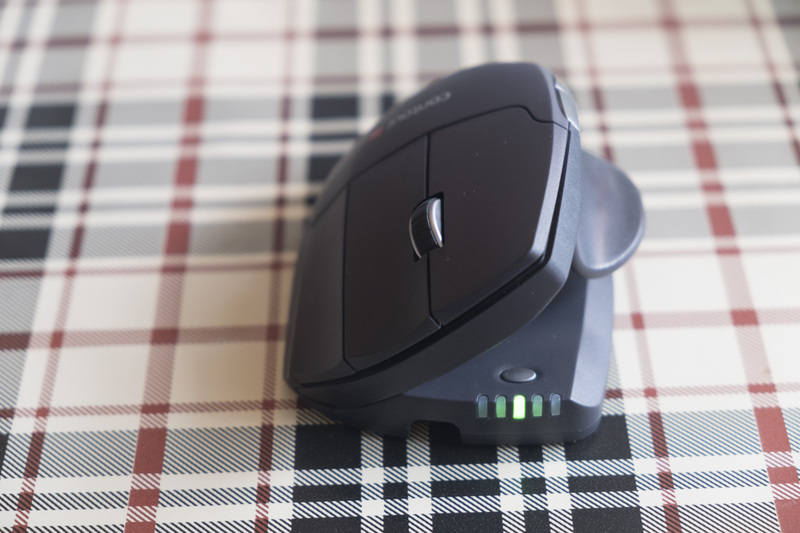 The heart of the Unimouse is its wide and adjustable body, which out of the box sits at a comfortable 35 degree angle that’s better ergonomically than a standard mouse. Between the left and middle mouse buttons, there’s a smooth scroll wheel with distinct tactile notches. There are two additional buttons on the left/top side, which are bound to Back and Forward in Windows by default to allow for rapid navigation through web pages, file directories and more. Below the main body of the mouse, there’s a curved and accommodating thumb rest. A ball joint allows the thumb rest to angle up, down, forward and back. You can also move the rest towards the front or back of the mouse along a rail, and telescope it in or out to suit your preferences. The friction-based system is easy to adjust, and stays in place effortlessly once changes are made. Towards the front of the mouse, below the adjustable main body, there are five status LEDs that can light up in green or red. A button nearby allows the sensitivity to be adjusted on the flow, stepping between 800 DPI and 2800 DPI in 200 DPI increments. This area also shows the available battery, and will begin flashing red once the mouse needs to be recharged soon. 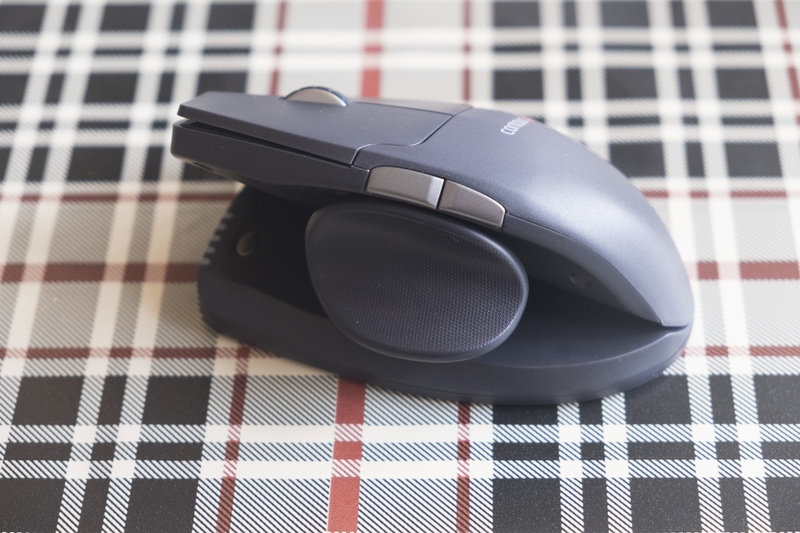 The body of the mouse can be elevated from 35 degrees to 70 degrees, allowing it to reach a near-vertical angle for the ultimate in ergonomic comfort. You’re free to change this angle whenever you wish, allowing you to engage different muscle groups and avoid a static hand posture. As with the thumb rest, a simple friction-based system makes adjustment easy. 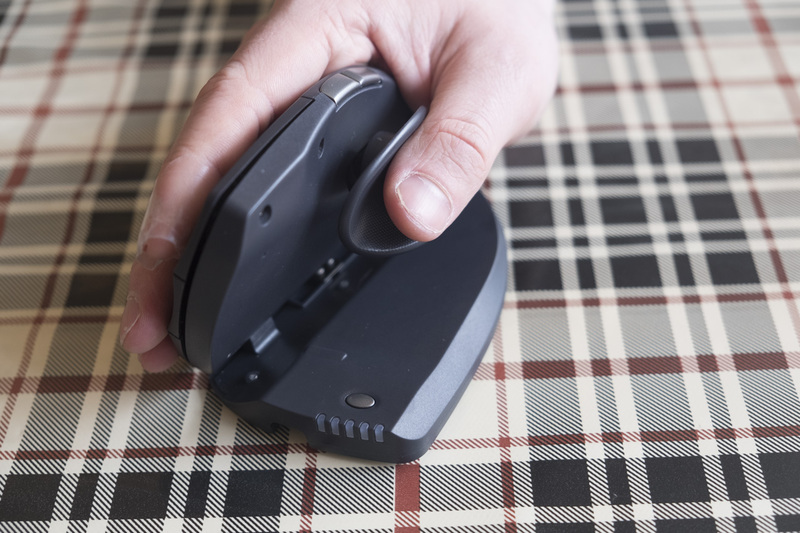 The adjustable angle also allows the mouse to be folded up for easy portability. The bottom of the mouse has three large skates that are suitable for all surfaces. Towards the front of the mouse there’s the PixArt PWM3330 sensor, a recent mid-range optical sensor with sterling credentials. The sensor lacks any unwanted built-in acceleration, allowing for pixel-perfect accuracy in games and spreadsheets alike. There’s also a power switch here, allowing both wired and wireless modes to be toggled on and off. The front of the mouse is where the Micro USB charging cable can be plugged in. By default you’ll use the mouse wirelessly, by plugging a tiny USB dongle into your computer. You can also use it wired if you prefer, and a lighter wired model is also available. The battery for the wireless version should last for three months of daily use, and definitely comes recommended for laptop users. That brings our tour of the hardware to an end, so let’s briefly cover the software side of the equation before we get into our testing results! To use macros or reprogram the buttons, you can install the Unimouse driver on Windows or Mac. The current driver page states that the driver is only available for Windows 10 or macOS, but you can go to the old drivers page for a version intended for Windows 7 or Windows 8. The drivers allow you to customise various aspects of the mouse, setting up macros, re-binding the buttons to different functions or choosing application-specific settings. The drivers offer similar functionality on macOS, although I wasn’t able to test them myself. I used the wireless Unimouse for a one week period with Windows 10, both on a desktop PC at home and with a laptop in cafés and trains. 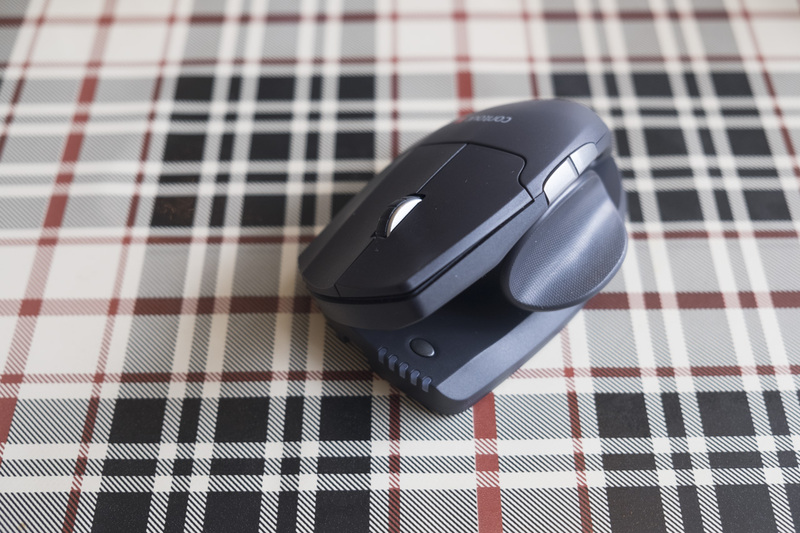 I noticed a significant difference in long-term comfort between using the Unimouse and standard flat horizontal mice. After using the Unimouse for six hours of work and a couple hours of games afterwards at its default 35 degree angle, my wrists felt a bit less painful than they did the day before. The following day, I consciously tried to adjust my hand’s position every hour or so. This seemed to provide better results, reducing pain in my right wrist to tolerable levels. Of course, this is only my experience — you may not experience similar results. However, having a full range of postures available should at least maximise your chances of finding a suitably comfortable position. Changing the angle of the main body and the thumb rest to suit was a very rapid affair, and even at its highest angle of elevation the mouse itself remained rock-solid. I did notice that elevating the vertical angle of the mouse to the maximum meant that I got some corresponding rotation in the horizontal axis; I wasn’t holding the mouse perfectly straight on the table. This meant when I meant to move right to left, the cursor on screen went down and to the left. That required a little mental readjustment when playing fast-paced games like World of Tanks or PlayerUnknown’s Battlegrounds. I later discovered that adjusting the angle of the thumb rest alleviated the problem, so it’s worth remembering this if you experience a similar issue. I also found telescoping the thumb rest out and sliding it forward made it more comfortable for my large hands, so remember rotation isn’t the only possible thumb rest adjustment! Overall, the Unimouse was as good as gold in my testing. 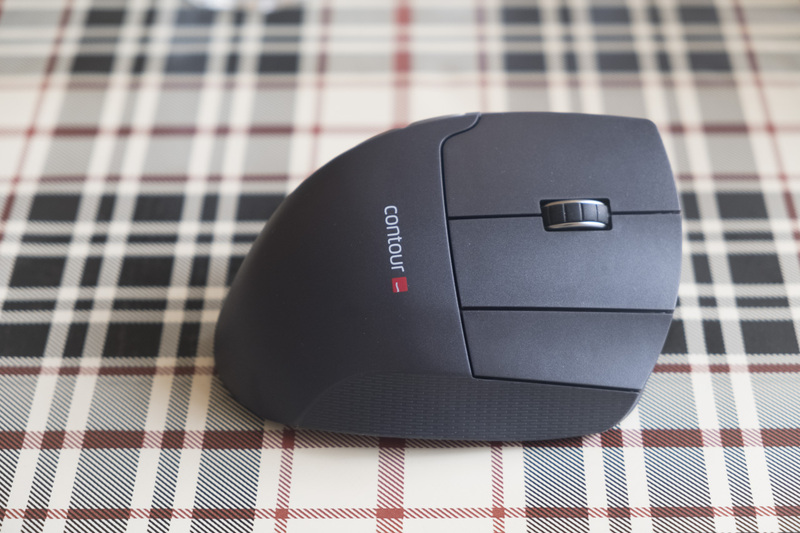 The mouse remained consistent and responsive throughout, with the wireless connection proving no problem on either the desktop or laptop I tested it with. Given its significant comfort improvement, I plan to continue using the Unimouse for work to hopefully prevent further RSI symptoms on my right hand. You can find the Contour Unimouse on KeyboardCo. Choose the wireless or wired versions below to see more information or to get one of your very own! Thanks for taking a look at the article! We hope it was helpful to you. If you have any questions or comments, feel free to get in touch via the comments below. You can also try messaging us on Twitter or Facebook. Thanks for reading the article and we’ll see you on the next one! Want to win some gaming gear, including a Filco Majestouch-2 keyboard, courtesy of KeyboardCo and others? Streamer Sophie ‘Cadaea’ Keen is doing a giveaway of six gaming peripherals, which runs until March 29th and is open to all EU residents (sorry, Americans and other international friends). Sign up via the link below, and be sure to follow us and the other sponsors on social media to maximise your chances of winning! 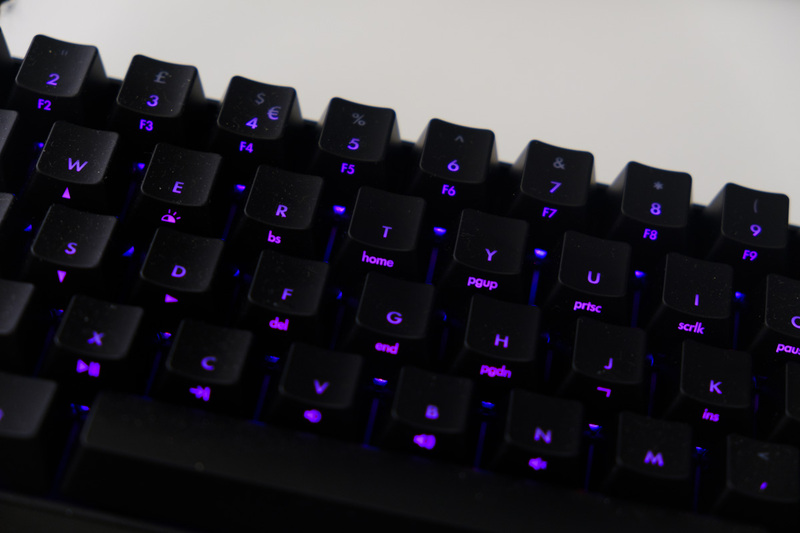 RGB backlighting is one of the biggest trends in the PC gaming space, where it can be found on peripherals like keyboards, mice and headsets. Instead of being forced to choose between just a few colour options when you buy a product, with RGB backlighting you’re able to choose any colour and change it whenever you like. You can sync up your different peripherals, light up in the colours of your favourite team, or just watch a rainbow of colours pulse and dance. Matias produce a range of modern keyboards, often inspired by classic Mac hardware, but they’re not averse to meeting customer demands for the latest trends either! With that in mind, allow us to introduce the Matias RGB Backlit Wired Aluminum Keyboard for Mac and PC! First, let’s cover the features you’ll find on this new iteration of Matias’ classic aluminum keyboard. 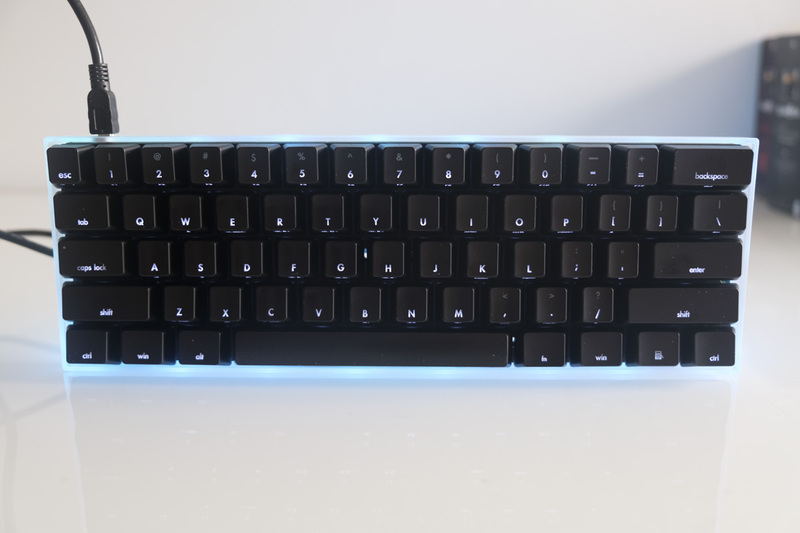 The RGB Backlit Aluminum Keyboard (hereafter: the Matias RGB) is a full-size keyboard, meaning it includes a numberpad and every other key you’d expect to find on a standard keyboard. It also has additional keys, including Mac and PC function keys on their respective models, including volume and media playback controls. The Matias RBG measures 441 x 116 x 19mm in all, making it reasonably wide but not tall or thick; perfect. The weight of the keyboard is substantial without being excessive, at 606 grams. In order to change the colours available, you use a dial placed on the rear of the keyboard, in line with the arrow keys. From here, you can spin the dial to change your backlighting colour quickly and easily. Going all the way to the left is white, all the way to the right is also white, and you have all the colours of the rainbow in between. You can also press the dial back to access the special Low Blue Light modes, which give you a choice of warm white, yellow and red. 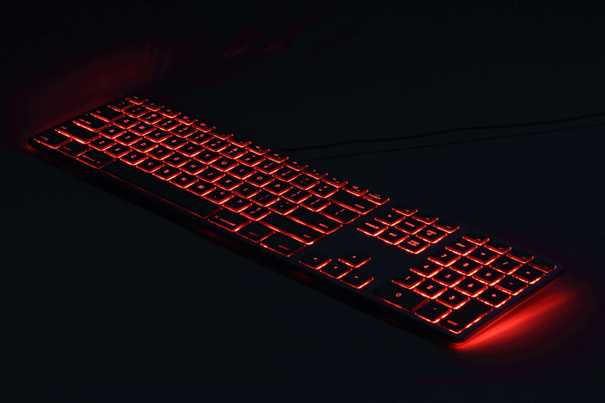 As the level of blue light in the backlight is reduced and red is increased, your natural sleep cycle will become less and less affected by the light produced by the keyboard. Of course, we recommend that you use the blue light reduction features built into the latest versions of macOS and Windows 10 to further reduce your Blue Light exposure from your monitor for best results. If you don’t have access to these features or you want more fine-grained control over their effects, we recommend the excellent free app f.lux as a fine alternative. The Matias RGB connects to your computer using a 1.5 metre USB cable. It also comes with a handy USB 2.0 port on one side, allowing you to connect a peripheral like a mouse, wireless receiver or USB storage drive. The RGB Backlit Wired Aluminum Keyboard from Matias will be available later this year, with precise release dates and prices still to be announced. The keyboard will be available in two variants: Space Gray for Mac and Black for PC. The model numbers are listed as shown; links and prices will be added once the keyboards are available at KeyboardCo! Thanks for checking out the article, and be sure to let us know what you think of the new Matias RGB keyboards in the comments below! We welcome your feedback, as always. Until next time, farewell! Today we’re looking at something rather special: a fully left-handed mechanical keyboard. Let’s take a quick look at this keyboard’s features before reviewing its design. Then, we’ll share our experiences using this keyboard for the past week! As you can see, this keyboard looks very different from a standard model. Instead of having the alphanumerics on the far left, then the navigation cluster in the centre and the numeric keypad on the right, we have exactly the opposite arrangement: numpad first, nav cluster second and alphanumerics on the right. This arrangement has an obvious benefit for left-handed users, who can access the numberpad and navigation cluster more easily with their dominant hand for faster and more accurate operation. n.b. This is a pre-production model, so its appearance will differ slightly to the final version although the layout and features will remain identical. It also has benefits for right-handed users. 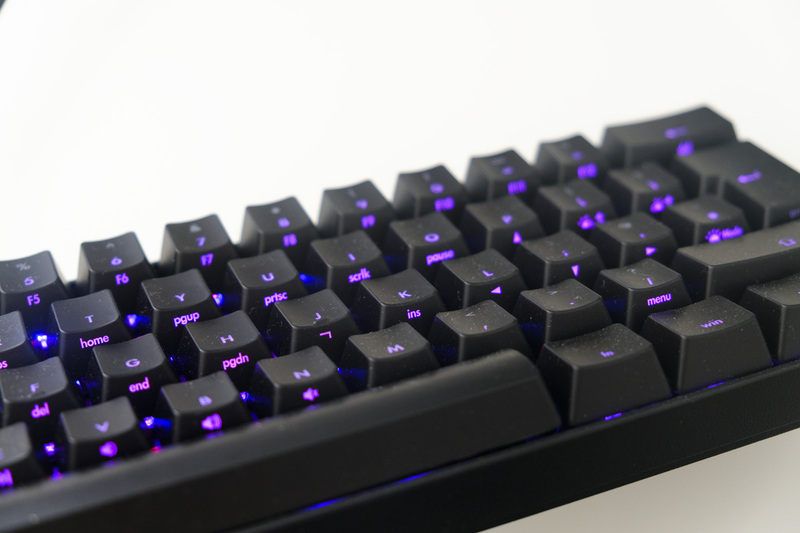 Many typists and gamers choose a compact keyboard layout, in order to keep the mouse further to the left and therefore more in line with the shoulder. 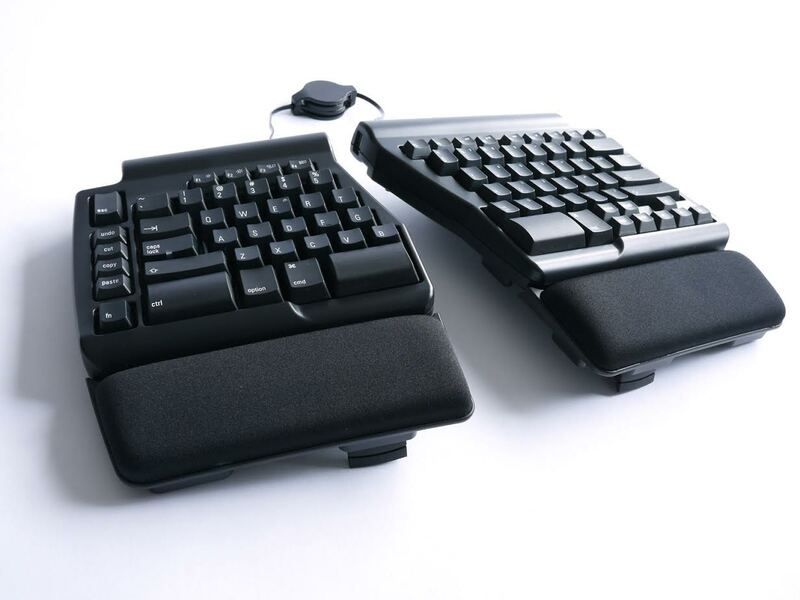 That reduces stress on the joints and promotes a healthier position for typing and gaming. However, it often means that the number pad and sometimes the navigational cluster are omitted, which can be annoying. With this left-handed keyboard, the numpad and navigational cluster are placed on the left, ensuring they’re out of the way but can still be used if needed. The keyboard also includes other labour-saving features. For example, a function button in the lower right allows access to additional functions on the F-key row, such as opening email or music apps, adjusting the volume or skipping tracks. You can also lock the Windows key, temporarily disabling it so you don’t press it by accident while gaming. You don’t have to sacrifice typing feel to go with this left-handed design, either. 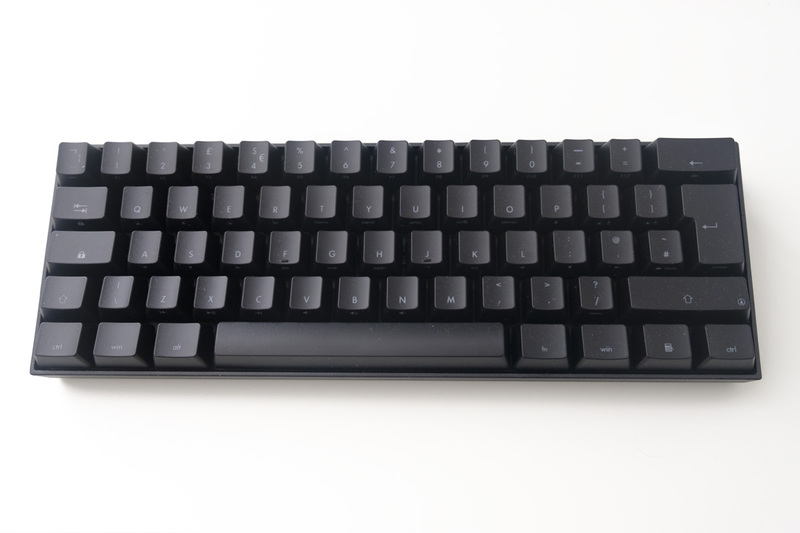 The keyboard uses a full set of MX Brown keys produced by Kailh, providing a tactile experience that works equally well for typing and playing games. The keyboard also uses a standard layout, allowing you to install new keycaps in different colours, styles or layouts. Other standard features are also included here. 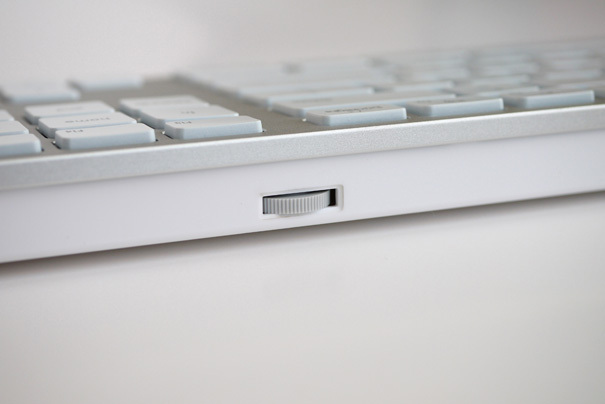 On the bottom of the keyboard, you can find three channels for the USB cable to be routed, allowing for tidy connection to computers to the left, right or directly behind. There are also flip-out legs that allow the keyboard to be used flat or at an angle. Now that we’ve covered this keyboard’s design, let’s move onto our impressions from testing the keyboard for a one week period! The left-handed layout is very interesting to use after you’re used to traditional right-handed layouts. For the first day or so, I was looking for the arrow keys to the right, rather than in the centre, and I couldn’t get my head around going to the far left of the keyboard for the number pad. Then, on the second day, something clicked in my head and I was able to use the new layout naturally and without hesitation. It’s really nice to be able to use the number pad and the mouse at the same time, making inputting numerical data in forms and spreadsheets a very rapid and comfortable experience. Similarly, I felt the benefit of having the mouse in a straight line from my shoulder, allowing me to keep my arm in a comfortable position at all times. I use a large mouse pad and a low sensitivity for gaming, so having this extra space was particularly welcome. In terms of typing feel, this keyboard excels. The Brown switches provide tactile feedback while requiring little force to actuate, making them an excellent choice for typing. I also played several matches of Counter-Strike: Global Offensive without any issues; each key was easy to find and could be pressed rapidly for strafing, selecting grenades and so forth. All in all, I had a great time with this left-handed keyboard and I’m really tempted to use this layout in the future — it just makes so much sense, I’m a little surprised that left-handed keyboards haven’t become more popular! The left-handed keyboard is coming soon to KeyboardCo. Stay tuned for more information including price and availability! 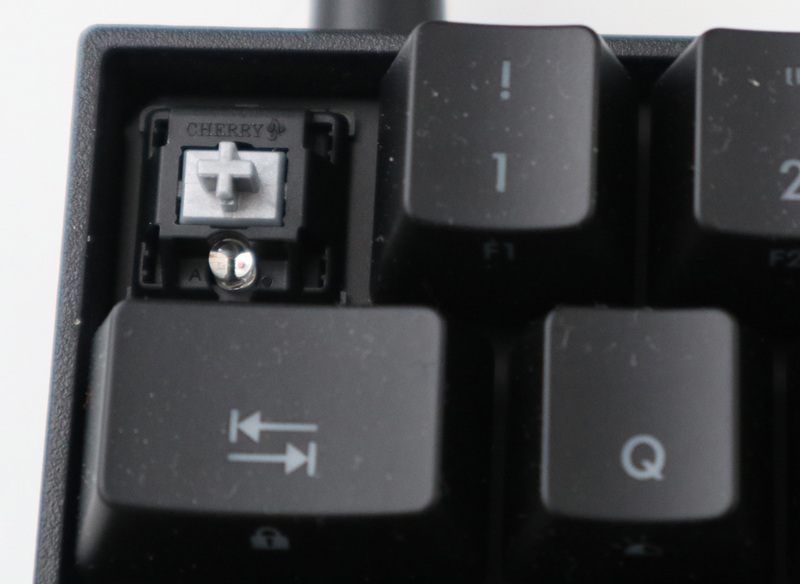 The most popular article we’ve ever published is a guide to Cherry’s MX switches, which lie at the heart of many mechanical keyboards. 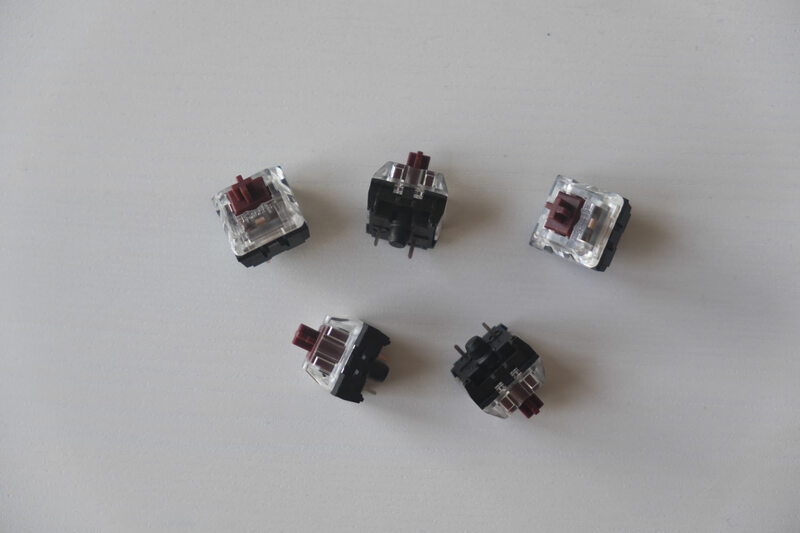 However, Cherry are far from the only company producing switches these days, and one increasingly popular alternative are Kailh switches made by Chinese firm Kaihua Electronics. Here’s everything you need to know. What Kailh switches are there? 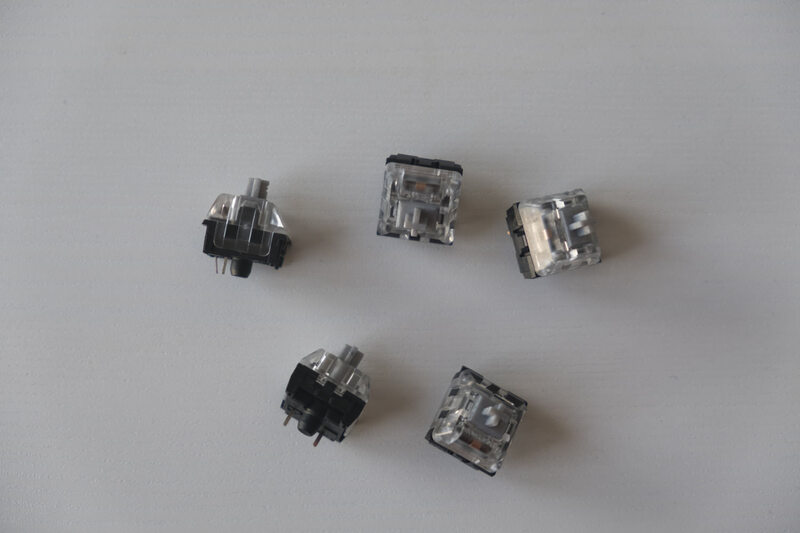 Like Cherry MX switches, different Kailh switches have different colours and corresponding characteristics. We’ll cover each of them in turn, explaining how their construction differs and what they’re like to use. 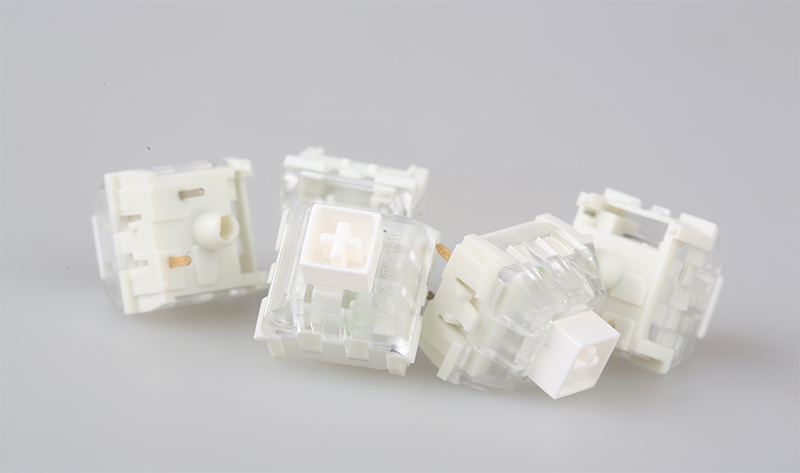 After that, we’ll look at some other common questions and answers regarding Kailh switches. 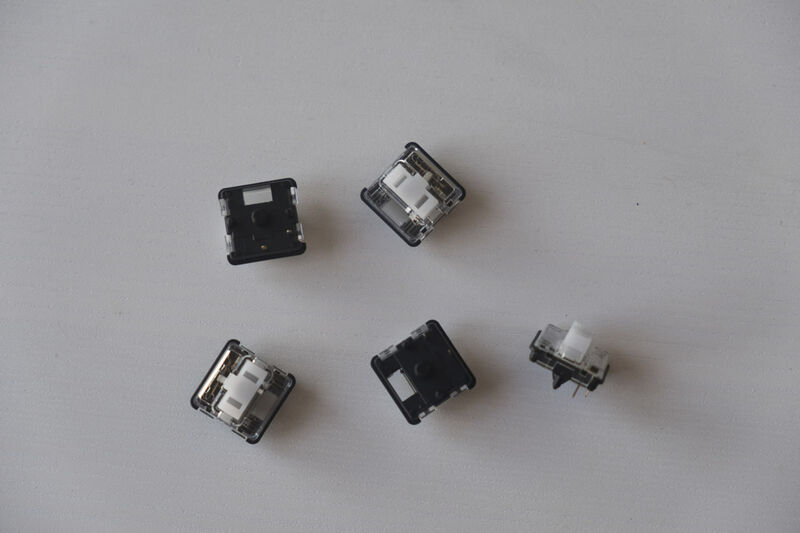 Kailh produce switches that operate near identically to Cherry’s original designs; these are legal clones. 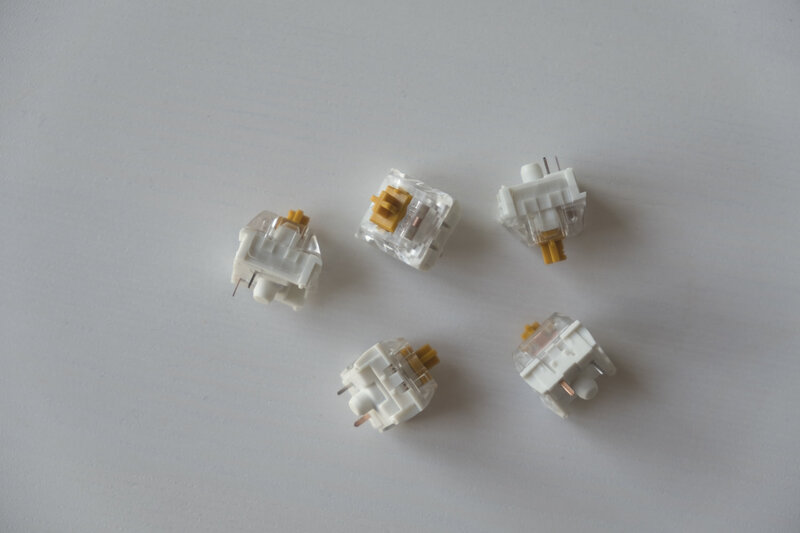 If you’re familiar with Cherry’s switches, these Kailh alternatives require little introduction: Blue is a tactile and clicky switch, Brown is a tactile switch, and Red is a light linear switch. We’ll call these Default switches, in absence of any existing nomenclature. According to testing by Input Club, there are some differences between the average Kailh switch and the average Cherry switch: the Red switches require a little extra force to actuate, the Blue switches require a little less, while the Brown switch is subtly different as it feels a little more… tactile. Despite these changes, the overall typing experience is quite similar. As explained earlier, speed switches are essentially shortened versions of existing MX-style switches, allowing for faster actuation and intended for gaming. 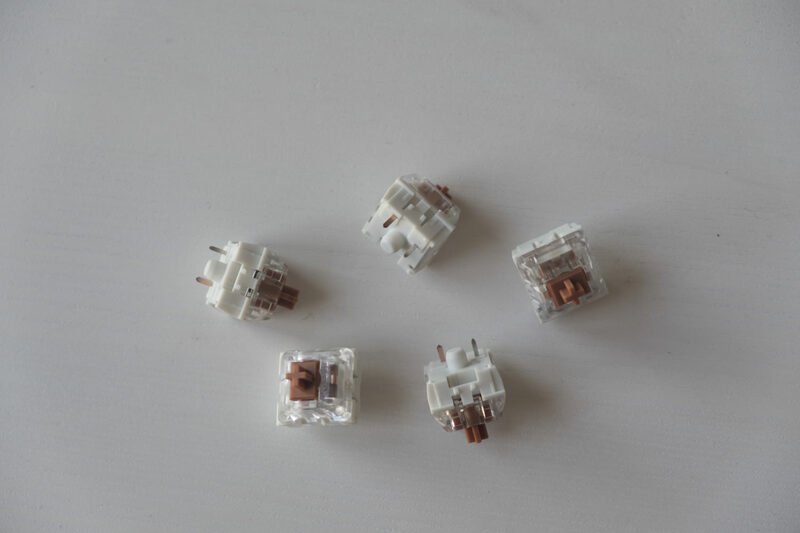 While Cherry produce a shortened linear switch, the Speed Silver, Kailh have produced four different shortened switches: Silver, Copper, Bronze and Gold. The Kailh Silver switch is much like Cherry’s Speed Silver: an extremely light (27cN) linear switch with shortened travel (3.5mm) and actuation (1.3mm) distances. 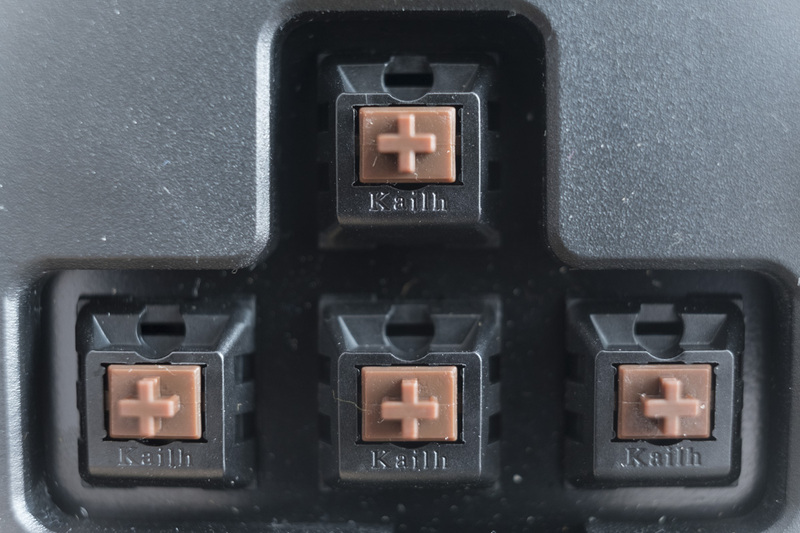 The Kailh Copper switch is a soft tactile switch, with a tactile bump and actuation point just 1.1mm into its 3.6mm travel distance. Combined with its light (40cN) actuation force, and you’ve got a switch that can handle both gaming and extremely rapid typing — definitely one to try. Kailh’s Bronze and Gold are clicky speed switches. That’s interesting because Cherry’s clicky switch, the Blue, is also one of its heaviest, requiring the most force to actuate. In comparison, the Bronze and the Gold switches provide that same audible clicky feedback, but they have the short actuation distances and minimal actuation force of other speed switches — cool! The Kailh Gold is more traditional in its construction, akin to a Blue switch but requiring less force and actuating faster to make it more suitable for gaming. The Bronze switch is more novel, with a second spring that provides the actual click sound effect. The resulting switch is somewhere between the Gold and the Blue when it comes to the force required (30cN, 40cN & 50cN) and tactile bump distance (1mm, 1.4mm & 1.5mm). So, to sum up, here are the four speed switches, a brief description, their recorded actuation force, actuation point and tactile bump point (stats via Input Club). 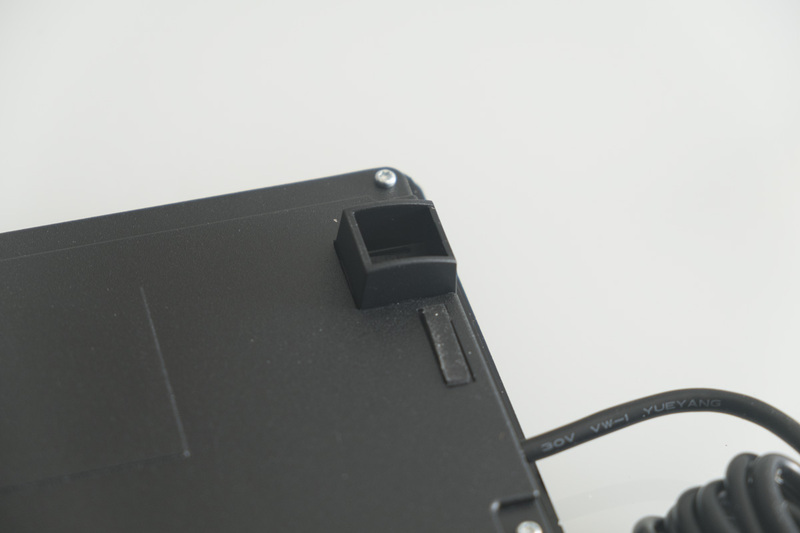 Identifying a Kailh box switch is pretty easy: just look for the box enclosure that surrounds the familiar cross-shaped MX style stem. 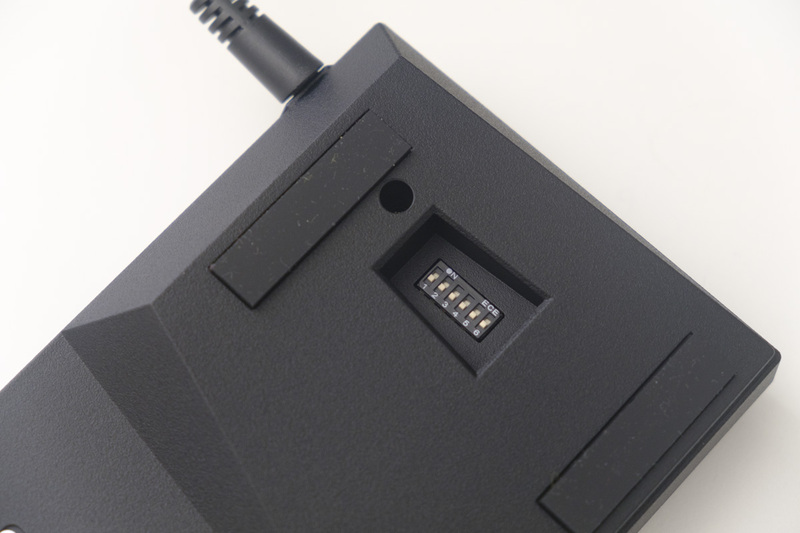 This box protects the switch from dust and moisture, and provides an IP56 resistance rating. However, the mechanism means that they’re only compatible with SMD LEDs, rather than the (slightly more common) through-hole LEDs. There are four different varieties thus far, each with a different colour: Box Red, Box Brown, Box White and Box Black. 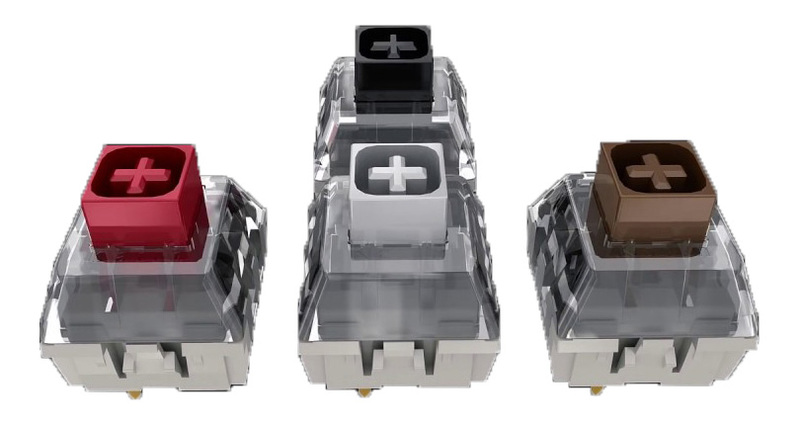 Again, if you’re familiar with the default switches, you can guess some of their characteristics: Box Red is a light linear switch, Box Black is a heavier linear switch, Box Brown is tactile and Box White is clicky. Interestingly, each Box switch has the same travel and actuation distances: 1.8mm for actuation and 3.6mm in total. That’s a little shorter than the Default switches, and you can feel a bit of a difference when it comes to speed. How do you pronounce Kailh? Kailh is usually pronounced the same as kale, that leafy cabbage. However, it’s a Chinese word and other pronunciations are relatively common. Are Kailh switches as reliable as Cherry ones? 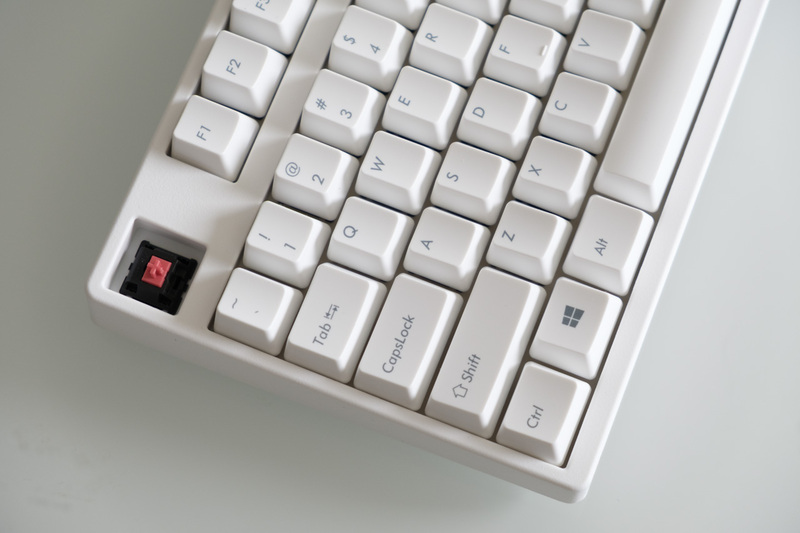 Based on on our own testing and general sentiment in the mechanical keyboard community, Kailh switches are every bit as reliable as those made by Cherry. The company has been making switches for decades, and its new models show the company’s interest and skill in this area. Are there other Kailh switches? Yes, for sure. There are tons. For example, the switches above are clicky low-profile switches — an interesting combination that brings to mind the best laptop keyboards! However, these three main groups are the most commonly available and/or interesting to talk about. If you’d like us to cover a different Kailh switch, let us know! I hope you’ve found this guide useful! Let us know what you think in the comments below, and if you have any questions or spot any inaccuracies then please get in touch. Thanks for reading, and we’ll catch you on the next one! School is starting up again soon, and whether you’re heading off to primary school or university you deserve to have a top quality keyboard to make your job easier — and a little more fun! Here are five of our favourites. 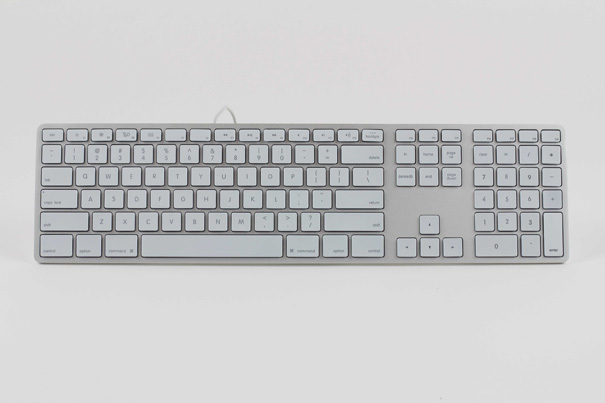 We’ll start with what 9to5Mac said is the keyboard Apple should have made… but didn’t. 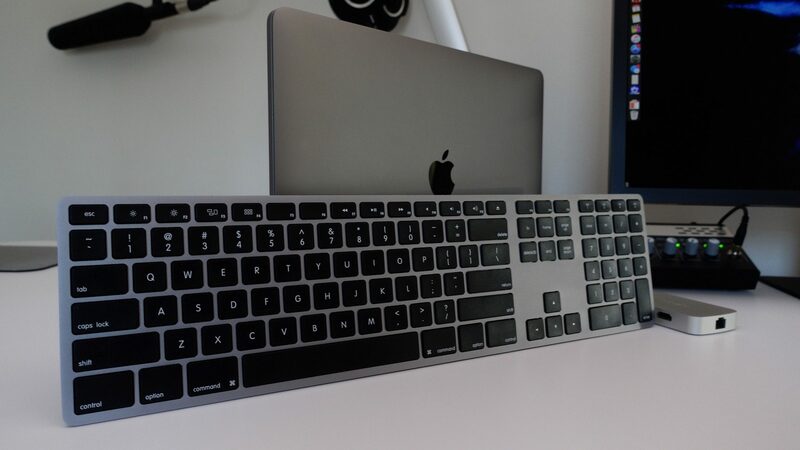 It’s the Matias Bluetooth Aluminium Keyboard, a full-size counterpart to Apple’s famous Magic Keyboard. This keyboard gives you a number pad, making it a perfect choice for anyone that is working with numbers, whether that’s doing data entry, working in science or engineering, or taking care of your finances. The keyboard is Bluetooth, so it works with basically every Apple device on the planet: iPhones, iPads, MacBooks and desktop Macs of all kinds. You can pair with up to four devices simultaneously, so you only have to go through the pairing process once per device. It includes function keys, it has a full year of battery life and it’s available in four gorgeous colours: silver, gold, space grey and rose gold. Awesome! 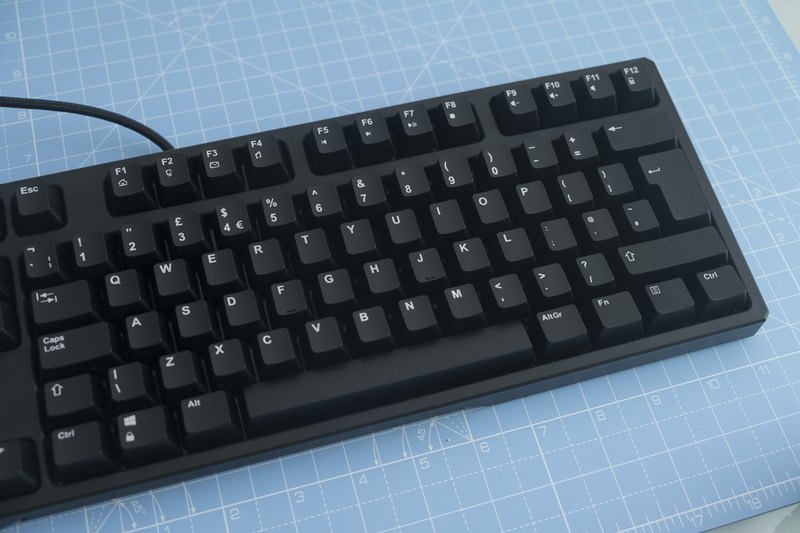 Next up we have one of the smallest mechanical keyboards on the market: the Filco MiniLa. 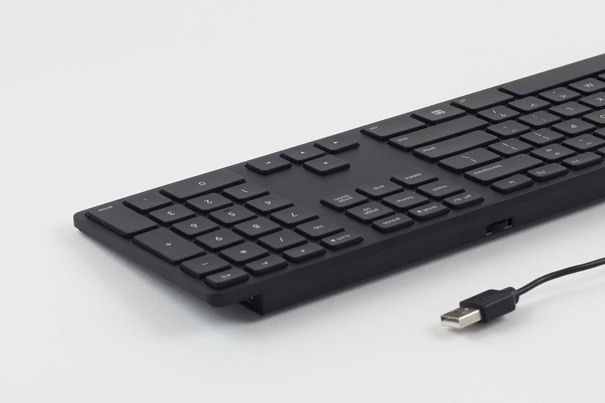 Standing for ‘minimum layout’, this 60% size keyboard fits easily into your bag to accompany laptops, tablets and phones — but of course, it will work on desktop PCs too! The mechanical switches provide a sumptuous typing or gaming experience, while the clever layout allows easy access to a number pad, arrow keys, media controls and more. You can get the MiniLa in both wired and Bluetooth variants, so choose the one that’s right for you! I called the Matias Ergo Pro my favourite ergonomic keyboard when I first had the chance to review it back in 2015, and I haven’t changed my mind since then. This ergonomic keyboard is a welcome relief to aching muscles, tendons and joints, providing a comfortable split design that is often far less painful than a traditional keyboard. The two halves are fully adjustable too, with a range of angles and orientations possible so you can find the most comfortable and convenient position for you. Best of all, unlike most ergonomic keyboards, this one comes with Matias Quiet Click mechanical switches. These provide great tactile feedback without the clattering noise of most other mechanical keyboards, making this a perfect choice even for a busy office. The Ergo Pro is also available in both Mac and PC layouts. If you need to type for work or school but you’re struggling with carpal tunnel or other symptoms, the Ergo Pro is well worth a try. Topre’s Realforce line of keyboards are beloved by keyboard fans for their gentle, almost pillow-y feel. 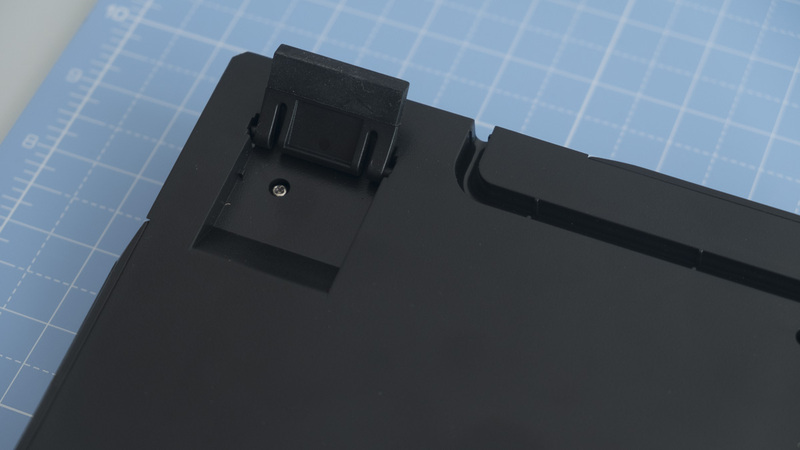 That’s down to their unique electro-capacitive switch design, which provides tactile feedback like a Cherry MX switch but with a soft and smooth feel. Realforce keyboards aren’t cheap, but they’re often the ultimate destination for mechanical keyboard fans who have tried it all. Whether you want a full-size keyboard or a more compact Tenkeyless layout, you’re sure to find a Topre keyboard that suits you. When it comes to mechanical keyboards, the Filco Majestouch has been the gold standard for a long time. 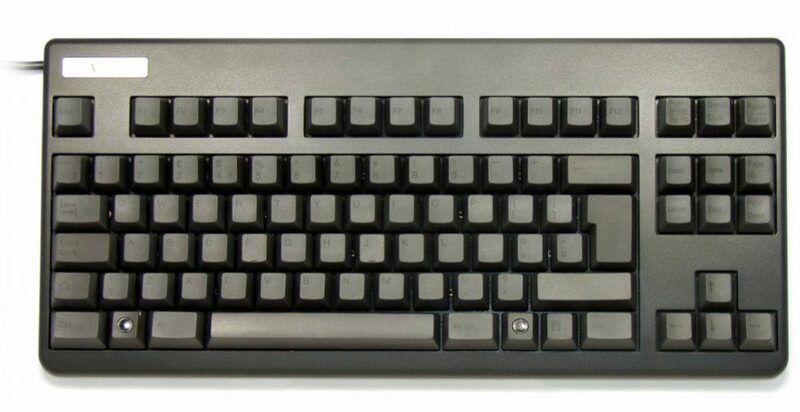 Filco was one of the first companies to produce long-lasting mechanical keyboards that focused on the typing experience, rather than superfluous keys or fancy lighting. You just get a rock-solid keyboard that feels great to use, and is easy to customise with keycaps, o-rings and other modifications. 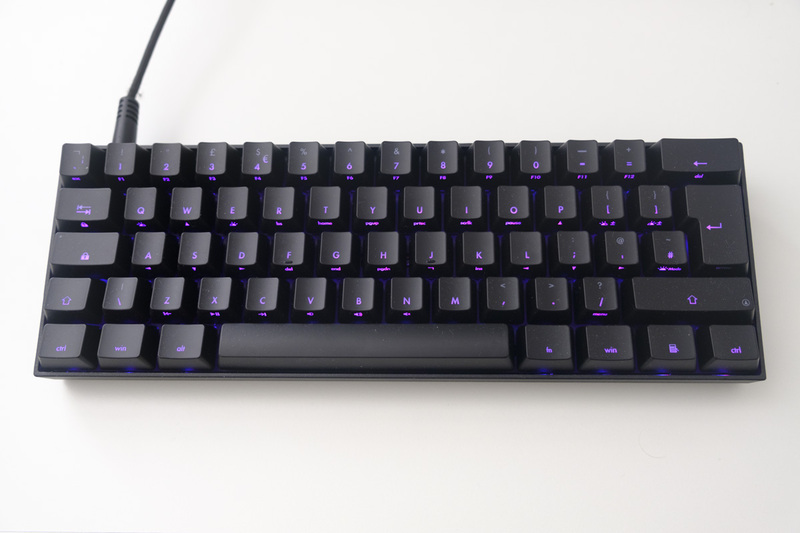 There are plenty of different Filco Majestouch keyboards available, with a range of Cherry MX switches, layouts, colours and sizes, so check out the full collection below. We hope our selections have been helpful! If you’d like a custom recommendation to meet your needs and specifications, then please leave a comment below or contact us directly via Facebook, Twitter, email or phone. We’d love to hear from you, so please get in touch! Thanks for checking out the article, and stay tuned for more mechanical keyboard goodness over the coming weeks, months and years! When I was a boy, keyboards only came in one size: large. 104 or 105 keys were the norm, and anything less would make you feel a little short changed! 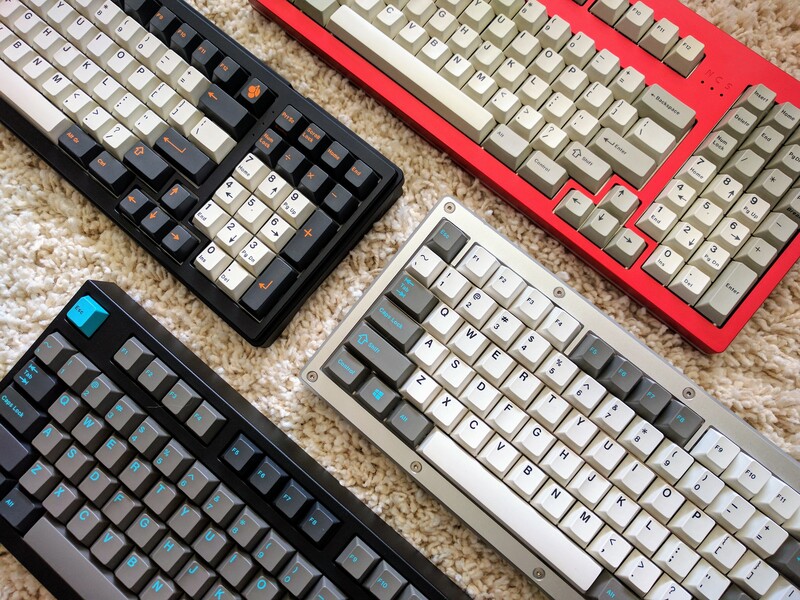 As mechanical keyboards have exploded in popularity, keyboard makers have created new layouts (and repopularised old ones!) with far fewer keys. We’re talking about Tenkeyless keyboards with 87 keys, or keyboards with 75%, 60% or even 40% of the keys you’d expect on a full-size keyboard. 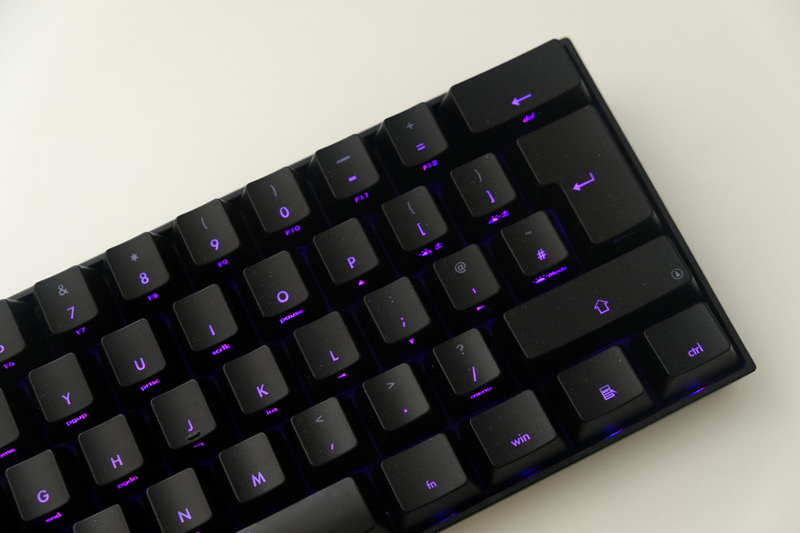 In this article, we’ll show you some of the most popular keyboard form factors, tell you about their strengths and weaknesses, and suggest some of our favourite keyboards of that type. Full-size keyboards. These have 104, 105 or even 108 keys depending on whether you’re talking about ANSI (USA), ISO (EU) or JIS (Japan) layouts. Generally the alphanumerics, navigational cluster and number pad are separated horizontally, with the F keys running along the top. This keyboard comes with an integrated number pad, typically on the right side, which is great if you’re inputting numbers frequently or you need the maximum number of keys at your disposal (for complex games like flight sims, for example). 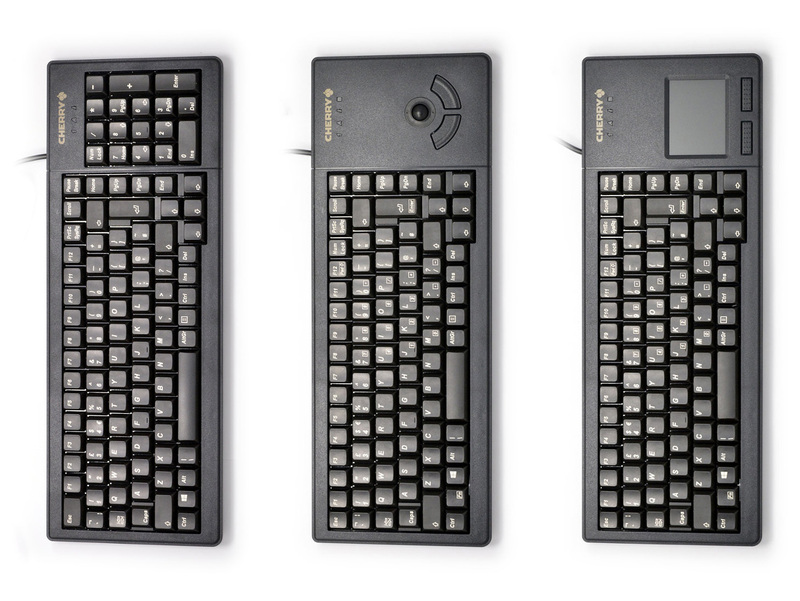 1800-Compact is an alternative full-size layout that has the same number of keys as a full-size keyboard in a slightly more compact arrangement. Here, the arrow keys are squished below the Enter key, while the other navigational keys go above the number pad. The result is a keyboard that looks unique, has all the keys of a full-size keyboard and takes up a tiny bit less space. Of course, you will need to relearn where those relocated keys have ended up, but it’s not the end of the world! 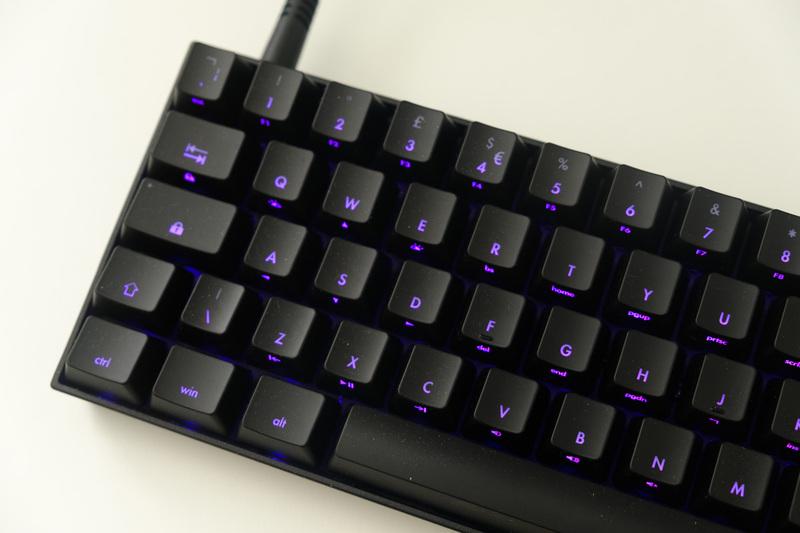 Tenkeyless or TKL is the most common compact keyboard layout, available from many mainstream mech manufacturers like Filco, Corsair, Razer etc. This layout is just a full-size layout without the number pad, resulting in 87 or 88 keys with about 80% of the width of a full-size keyboard — hence the alternate names for TKL being 87% or 80%. 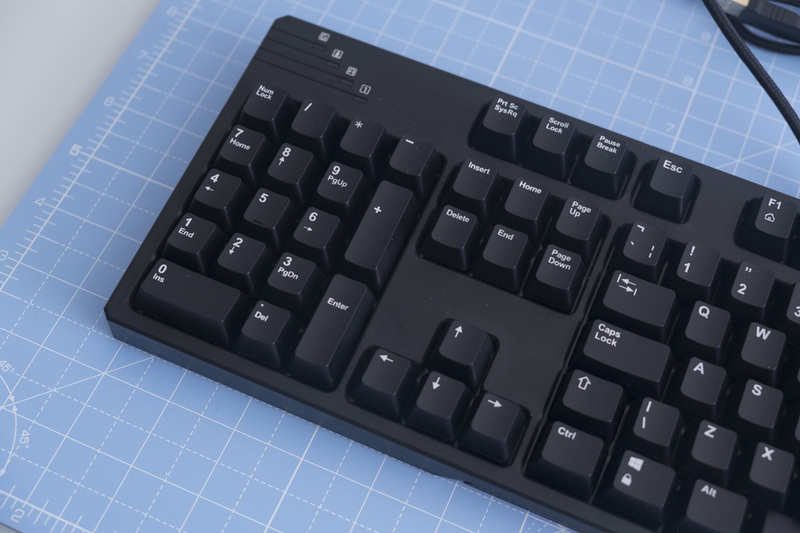 Tenkeyless keyboards are a popular choice because they are easy to use (and manufacture); you don’t need to learn a new layout, you just need to accept the loss of the number pad. 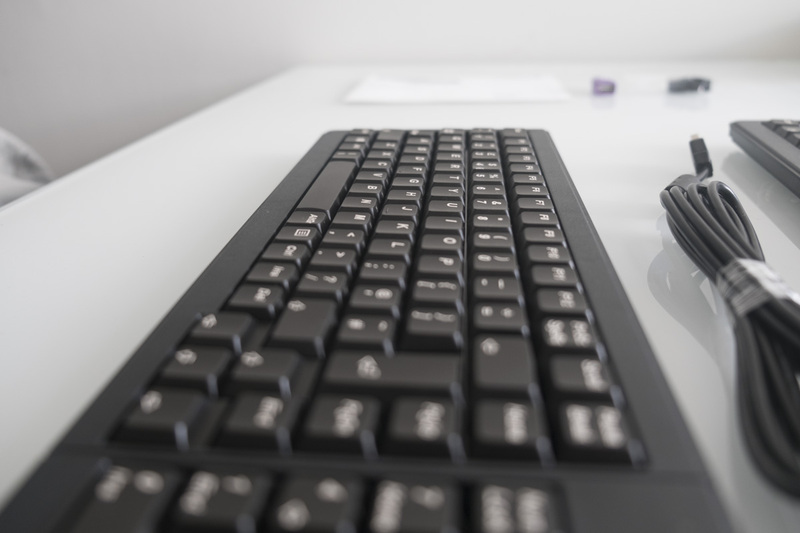 In exchange for giving up the number pad, you get several advantages: the keyboard takes up less space on your desk, allowing you to adopt a more ergonomic posture and giving more space for your mouse. The reduction in size also means a reduction in weight, making it easier to lug your mechanical keyboard around. Finally, having fewer switches also means your keyboard should be a little cheaper to manufacture, although the industry standard is not to charge less for a TKL layout. 75% is the common name given to keyboards that have a compact layout, roughly 70 to 75% of the width of a full-size keyboard, but retain the F key row at the top. 75% keyboards are popular because they only shrink or remove a few keys compared to a TKL; most of the space saving is done by reducing the gap between different areas of the keyboard and placing keys like Insert, Delete and Home in a single column on the right side of the keyboard. However, these changes mean that finding replacement keycaps is sometimes difficult. 60% is perhaps the most common layout after full-size and TKL. As well as ditching the number pad, 60% keyboards also lack a F key row at the top and the navigational cluster on the right — you just get the alphanumeric zone. These missing functions are accessible via a Function (Fn) key, usually near the bottom right side of the keyboard. Generally the F keys are accessible by pressing the corresponding number key (e.g. Fn + 1 = F1), arrow keys are accessible via WASD (Fn + W = Up) and navigational keys are spread along the right hand side of the keyboard (Fn + P = PrtSc)… but plenty of variation is possible between different manufacturers and models. 60% keyboards are a little more challenging to learn, but provide excellent space and weight savings compared to TKL and full-size keyboards. That makes them super portable and they just plain look cool as well. 40% keyboards are generally thought of as the smallest usable layout. 40% keyboards ditch the number row, leaving just the letters and the modifiers… and due to the small number of physical keys, there are multiple layers accessible via special keys. These keyboards aren’t yet made by mainstream companies, so if you want one you’ll generally have to buy the parts and build it yourself… or get someone else to make it for you at considerable expense. 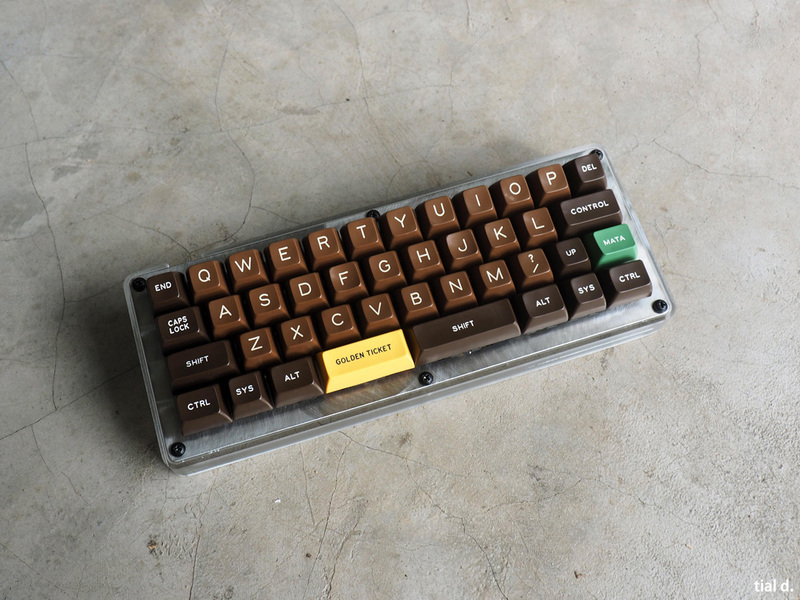 While the layout is challenging, these keyboards do look incredible, with a sweet retro style. 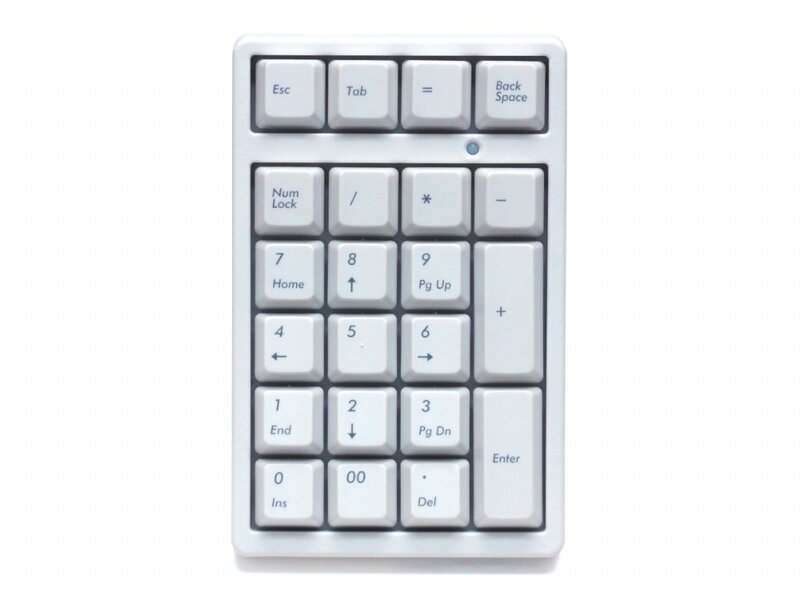 These tiny dedicated number pads usually have 21 keys, giving you all of the keys on a normal full-size keyboard’s number pad plus a few extras — perhaps for functions like Escape, Tab or Backspace. 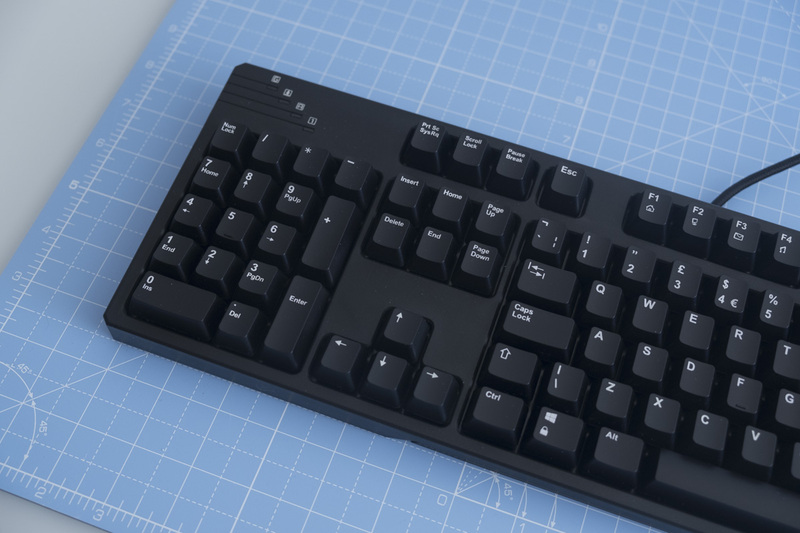 These are the perfect complement to Tenkeyless or smaller keyboards, as they eliminate one of the weaknesses of a compact layout without permanently taking up desk space. 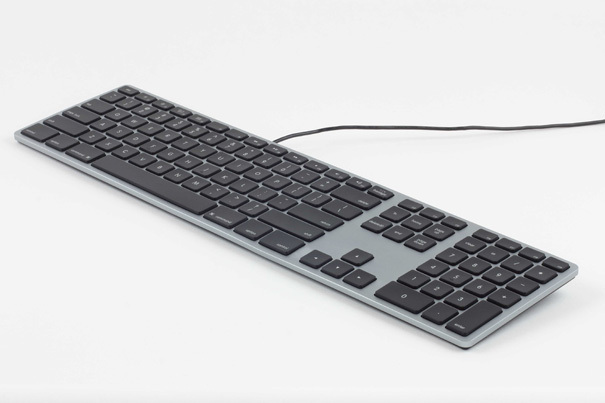 Having a separate Tenkey also means you can place your number pad on either side of your keyboard — and if you’re right-handed, placing it on the left means that you still get all of the room for your mouse. These keyboards aren’t really keyboards — they’re basically switch testers that you can hook up to your computer to use as extra macro keys. 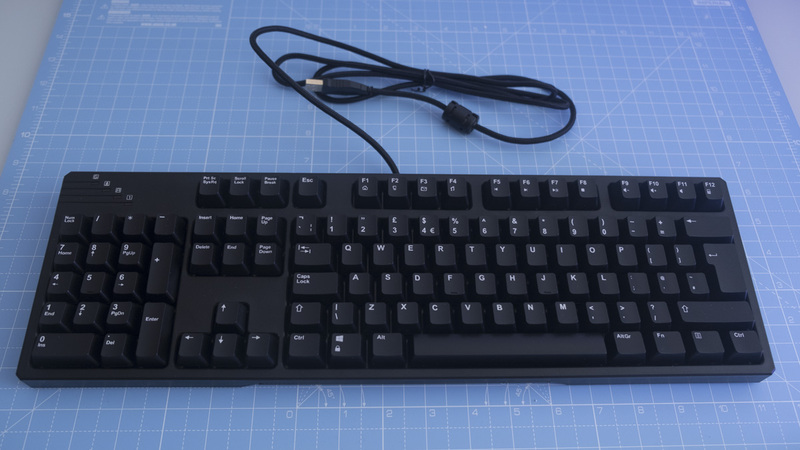 However, if you find yourself desiring macro keys without wanting to switch to a full-size mechanical gaming keyboard, picking one up can make sense. This isn’t exactly a common layout, but it’s so brilliant that I had to include it. The binary keyboard is the creation of /u/duckythescientist on Reddit, and it’s got three buttons: one, zero and enter. You enter the binary representation of the corresponding ASCII or Unicode character that you want, then press Enter to send it to the keyboard. I don’t think this layout will take off, but it’s certainly an engineering triumph! OK, so there we have it! Keyboards from 108 keys all the way down to three. I hope this guide has proven useful! If you have any feedback or questions, please get in touch via the comments below. 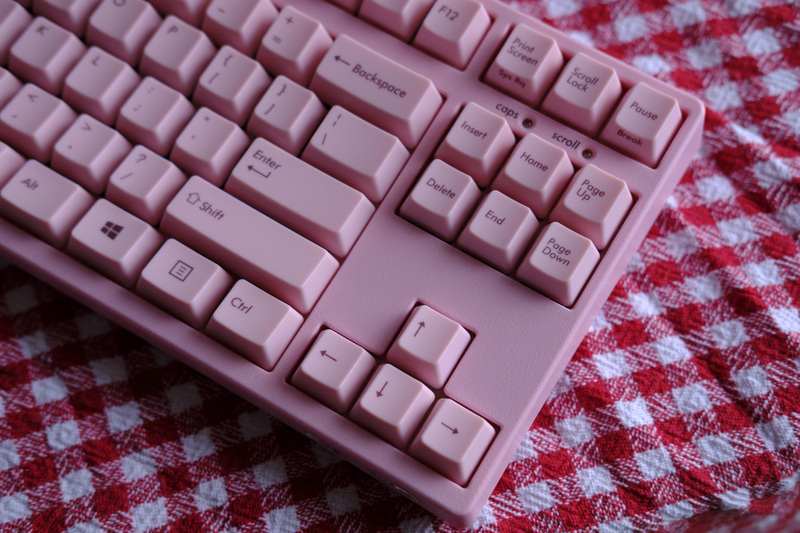 Cherry are well known for making their MX mechanical switches, but they also make a nice range of keyboards themselves. 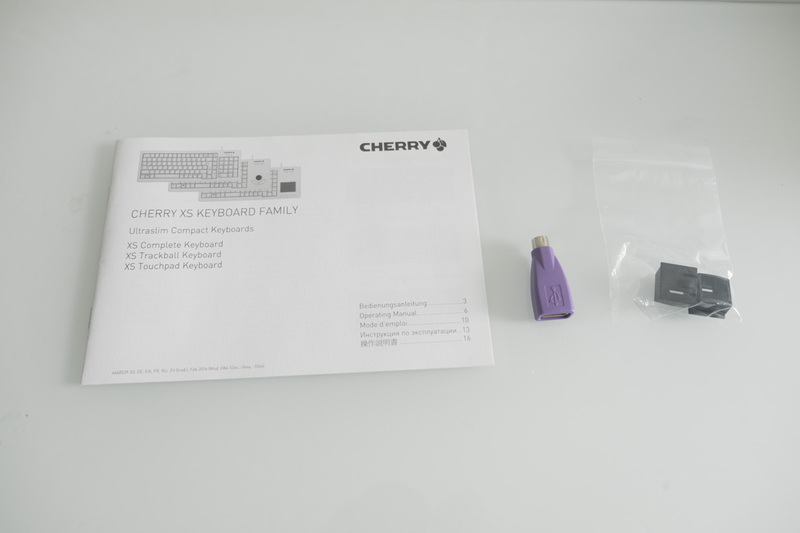 Today we’ll be looking at three Cherry keyboards in the XS family: the XS Complete Keyboard, the XS Trackball Keyboard and the XS Touchpad Keyboard. These keyboards are designed for industrial or medical use, but can be used anywhere you need a compact and durable low profile keyboard! Each of these rack-style keyboards use Cherry ML switches, a low profile variant of Cherry’s MX design. These switches have a tactile feel and actuate at 45~50 cN of force, like a Cherry MX Brown, but have less travel distance. They’re also incredibly robust, rated for 20 million key presses in their service life. When typing on the ML switches, you get much of the same excellent tactile feedback as you would expect on a full-size mechanical keyboard. The keys are a little smaller, but it’s still possible to type with speed and precision. The choice of a number pad, trackball and touchpad is also quite helpful, as it means you only need to invest space, time and money into a single device, rather than needing to find a separate mouse and keyboard. 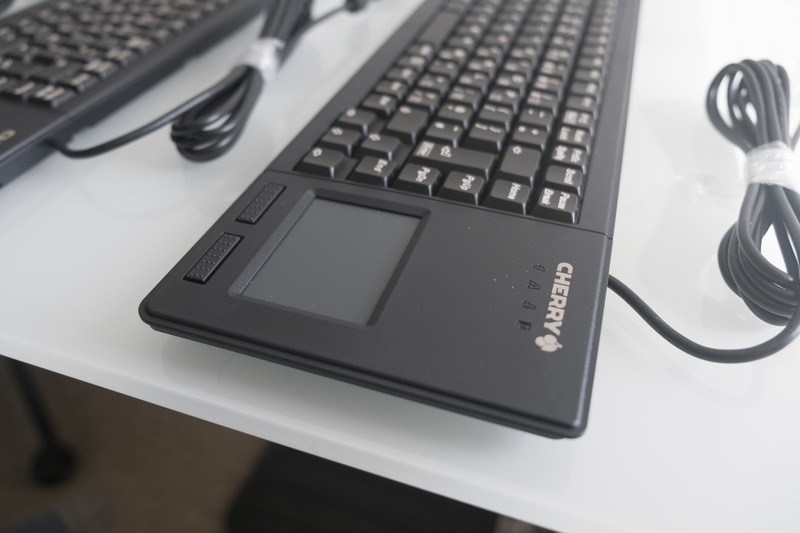 These keyboards largely resemble their office peers, but there are some small touches here and there which show the care Cherry have put into designing the ultimate industrial / medical keyboards. 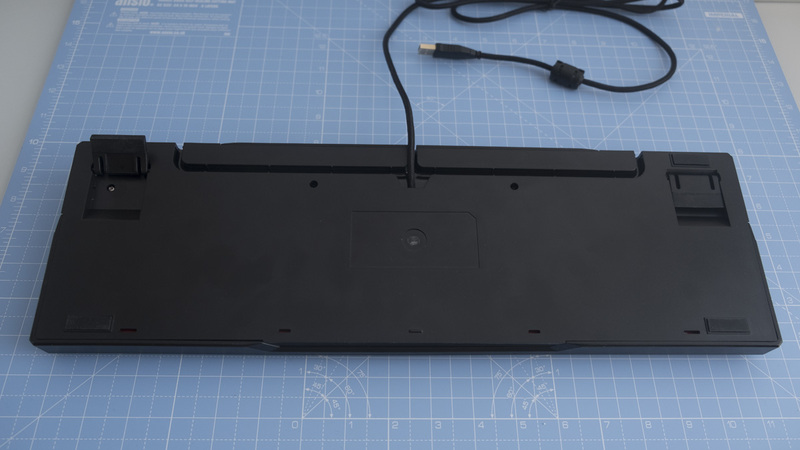 On the bottom of the keyboard, there are places for two plastic feet to be inserted. Once plugged in, they’ll stay at a constant angle, unlike the folding feet on office keyboards that will sometimes sag over time. 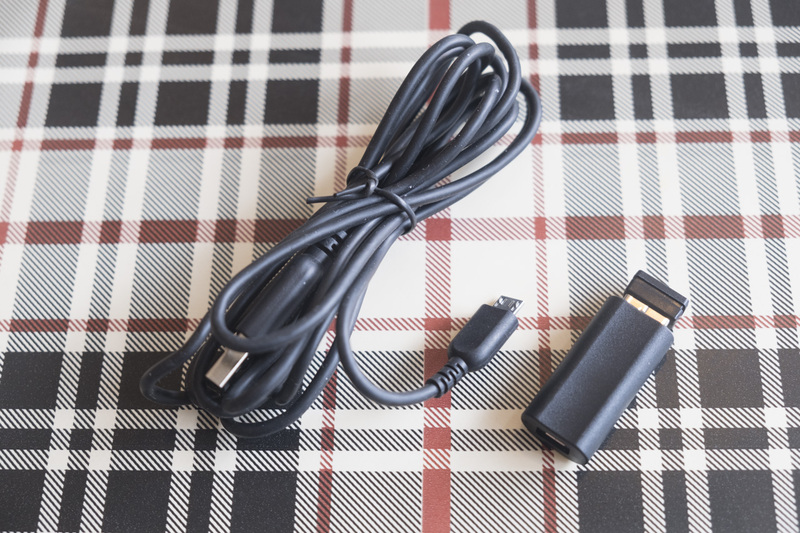 The USB connection has also been upgraded for industrial use, with a thick cable that stretches 2.5 metres. As well as the feet, you get some paper instructions. Additionally, the XS Complete comes with a PS/2 adapter; the other two models require USB as they are both a keyboard and mouse in one package. These keyboards are ultimately built to last. 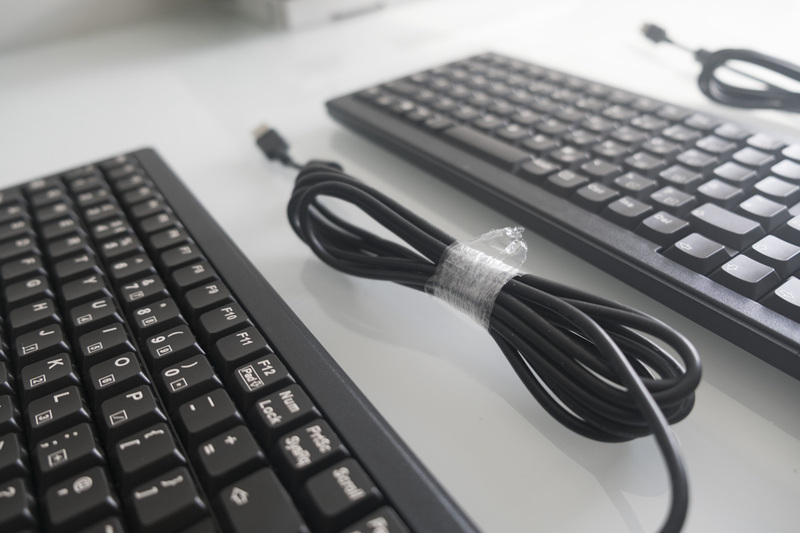 The mechanical switches should last a long time, and the keyboards are rated for use between 0 and 50°C. They come with a two year warranty as well. All three models are available now at KeyboardCo. For more information or to place an order, please take a look at the product pages linked below. If you have any questions or feedback, leave a comment below or speak to our team: 0845 205 5555 or sales@keyboardco.com. Thanks for checking out the article, and have a great day! Let’s put this new KBP keyboard to the test! We’ll start with a quick look at the design of the keyboard. The V60 is a very compact keyboard, comprising of about 60% of the keys of a full-size keyboard with a numberpad. The layout, which is UK (ISO), dispenses with dedicated keys for F1 – F12, navigational keys (Insert, Delete, etc.) and the number pad, with these functions instead accessible via a Function (Fn) layer. The smaller size results in a portable design which takes up minimal desk space, and it looks cool too. Despite the small number of keys, this keyboard is hardly lacking in functionality. Its comprehensive Function layer includes media controls and volume adjustment, LED backlighting controls and more. The keyboard includes a unique dual-LED backlighting system, wherein each key is backlit by both a red and a blue LED. These LEDs can vary in intensity, allowing for full red, full blue, or a number of pinks and purples in between. This is a nice halfway house between a full RGB keyboard (which generally requires more complex controls and more expensive components) and a simple single-colour backlighting system (which might not fit your preferred colour scheme). This way, you have some flexibility without the cost or complexity of a full RGB system. The flexibility theme continues if you have a look at the back of the keyboard. On the right side, you’ll find six tiny DIP switches. Look them up in the manual, and you’ll find that you can customise the positions of the modifier keys extensively — you can have Fn replacing Caps Lock (! ), Escape swapping positions with Grave (`) or Alt and Win swapping places (to support a Mac layout). This is helped by the inclusion of nine additional keycaps, which ensure your keys remain accurately labelled. 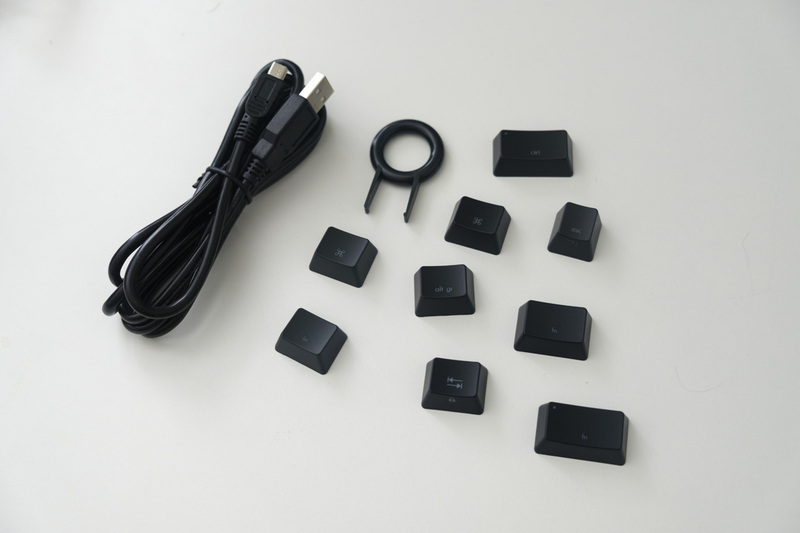 In addition to the replacement keycaps and the manual, a Mini USB cable and a key puller are included in the box. Finally, the keyboard’s firmware can be upgraded over USB, allowing the keyboard’s functionality to be improved and bugs to be fixed after purchase. Of course, we couldn’t discuss this keyboard’s design without also covering the switches that lie at its heart. 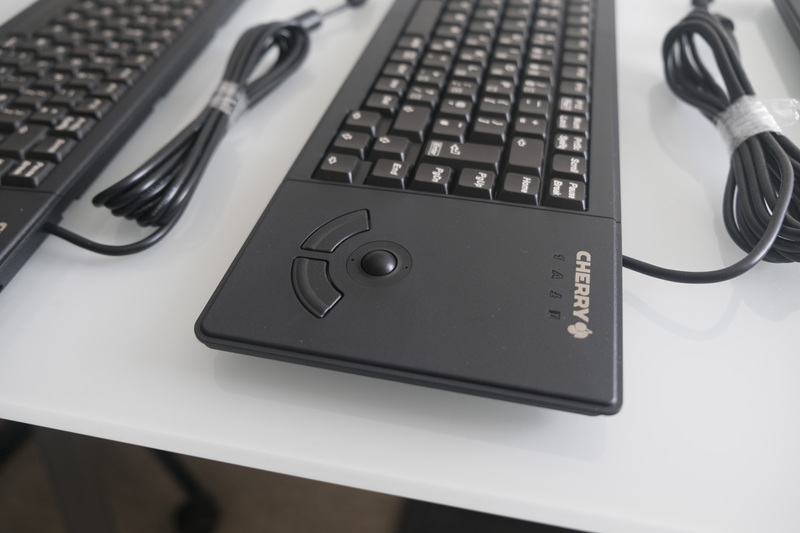 It’s possible to get the V60 Plus Dual with several different switches, but for the UK layout keyboard you have a choice of the old reliable Cherry MX Brown and the new, exciting Cherry MX Speed Silver. It’s the latter that we have in our review unit, so let’s cover the basics. The Speed Silver is a linear mechanical switch designed to actuate very quickly, making it ideal for the rapid key presses you might need while gaming. The actuation distance has been shortened from 1.5mm to 1.2mm, while the total travel distance has been reduced from 4mm to 3.4mm. It has a clear body, allowing the LEDs below to shine through. Finally, it uses the same springs as the Cherry MX Red, giving it roughly the same actuation force of 45 cN. Now that we’ve covered the design and features of the keyboard, let’s get into our first-hand impressions after using this keyboard for a week or two! These Speed Silver switches were the biggest draw when I first heard about this keyboard, so I’ll share my impressions of these first. Generally, I find them to be a superior version of the Cherry MX Red, equally light but just a little bit faster to use. That can make it a bit easier to make a typo, but the increase in speed (whether actual or psychological) feels substantial. I found this really helpful in games like Counter-Strike and PlayerUnknown’s Battlegrounds (PUBG), where you really want to improve your reaction time wherever possible. Choosing a high refresh rate monitor and a precise mouse makes it easier to respond in-game, but so too does having a super quick keyboard. I expected the Speed Silver switches to be a little difficult to type on, but happily I didn’t find that to be the case at all. The switches are light, sure, but not more so than a Cherry MX Red, and the increase in typing speed made up for occasional typos. I was able to hit 104 words per minute when playing on TypeRacer.com, and my average across ten races was 92 words per minute, compared to my lifetime average of 87 words per minute. Not bad! Whenever I use a compact mechanical keyboard, I always worry that one of my most-used keys will be hidden somewhere in the Function layer, causing me to waste time tracking it down each time I need to use it. Happily, that wasn’t the case with the V60 Plus. I didn’t miss having the function keys available, as I rarely use them outside of a few game commands (e.g. quick save and quick load in an RPG, for example); similarly I rarely use a number pad so I didn’t mind that either. The only thing I really pined for were the arrow keys while writing. At first I used the arrow keys on the right side of the keyboard (Fn + P L ; ‘ ), but I found that a bit difficult, so I used the DIP switch on the back to change the Caps Lock key (which I never use) to another Fn key. That let me use Caps Lock + W A S D to move around in text, which was quite intuitive. Otherwise, I didn’t have any issues with the compact size of the keyboard, and I certainly appreciated the light weight and small size when taking the keyboard on the train to work. It also gave me tons of room for my oversized mousepad; this is the ultimate upgrade for (nerd alert) low-DPI-setting Counter-Strike players. The small size also just looks cool, particularly when combined with the blue to purple to pink to red backlighting. 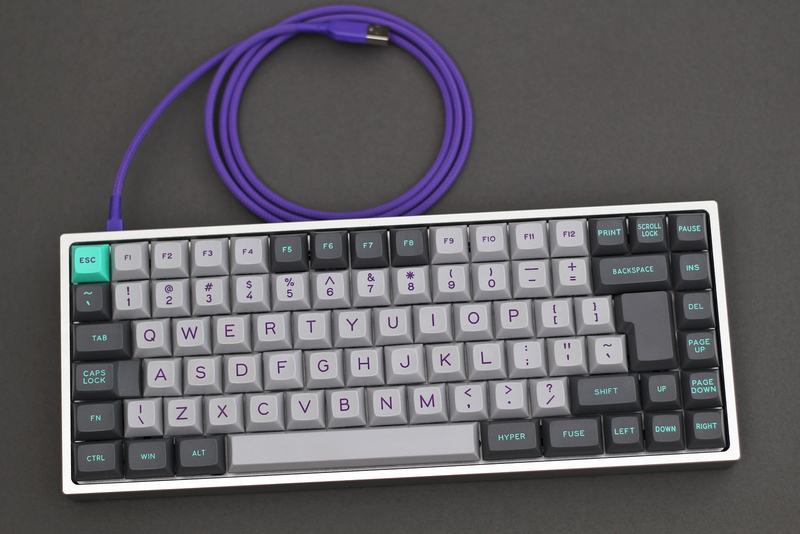 Overall, I really enjoyed using the KBP V60 Plus with Dual Backlight and Speed Silver switches. There’s always a keyboard or two that I’m hesitant to give back after I’ve finished reviewing them, and the V60 Plus is certainly one of them. It doesn’t have the crazy backlighting of the Type R Polestar, but the compact layout, Speed Silver switches and pinky-purple backlighting are an awesome combination. Thanks for checking out the article, and be sure to let us know what you think of this keyboard in the comments below! If you have any questions, we’d also be happy to answer them if we can. Thanks again and enjoy your week! These are the genuine reactions to one of our latest arrivals, the Pink Filco Majestouch-2 Tenkeyless mechanical keyboard. 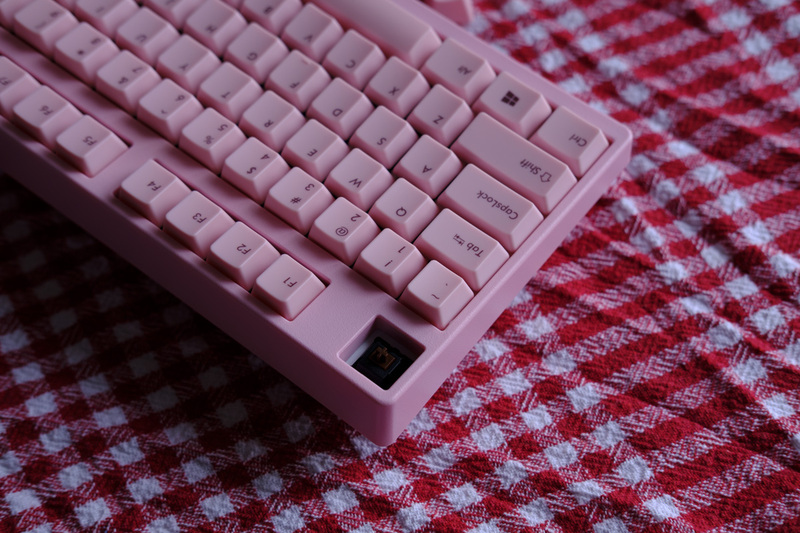 As you’d guess from the name, this compact mech comes with pink keycaps, a pink cable and a pink case for a full-on pink look. 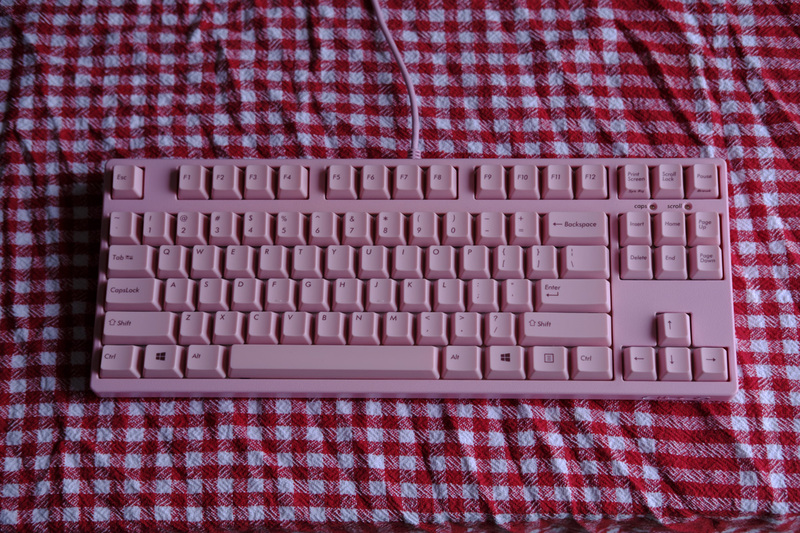 This stylish keyboard is perfect for all princesses at heart, or just fans of this particular shade of lightish red. 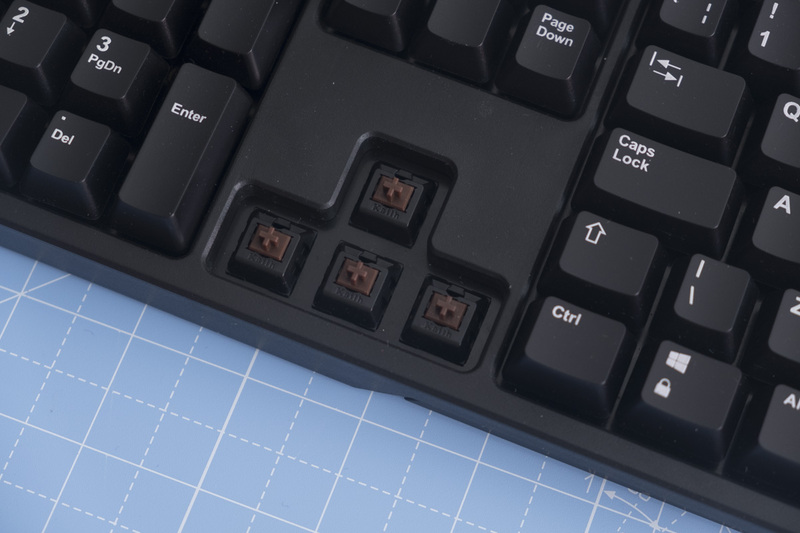 Inside, you’ll find the most popular mechanical switches: Cherry MX Browns. These tactile switches feel nice for typing or gaming, with a light actuation force that is comfortable for hours on end. 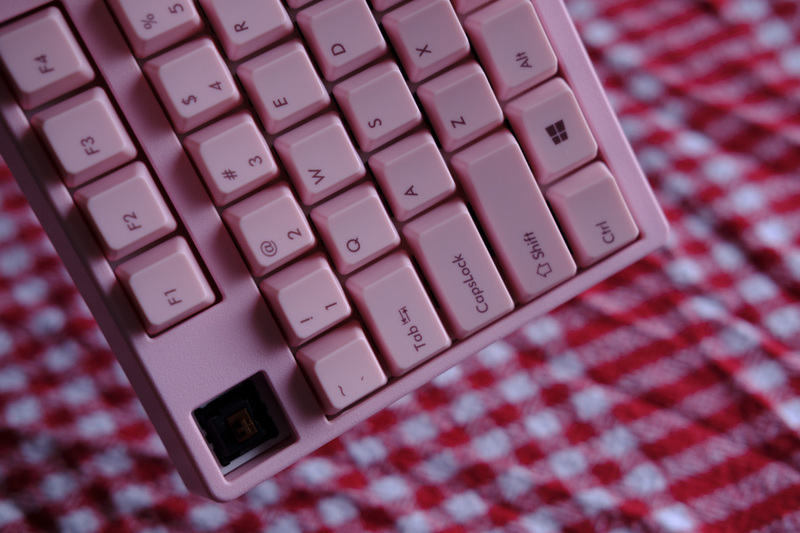 There have only been positive reviews of the Pink Filco from our customers so far, with users praising the cute colour, great performance and comfortable compact layout. We’re sure you’ll like it too, so if you dig the colour scheme then take a look at the product page for more information! 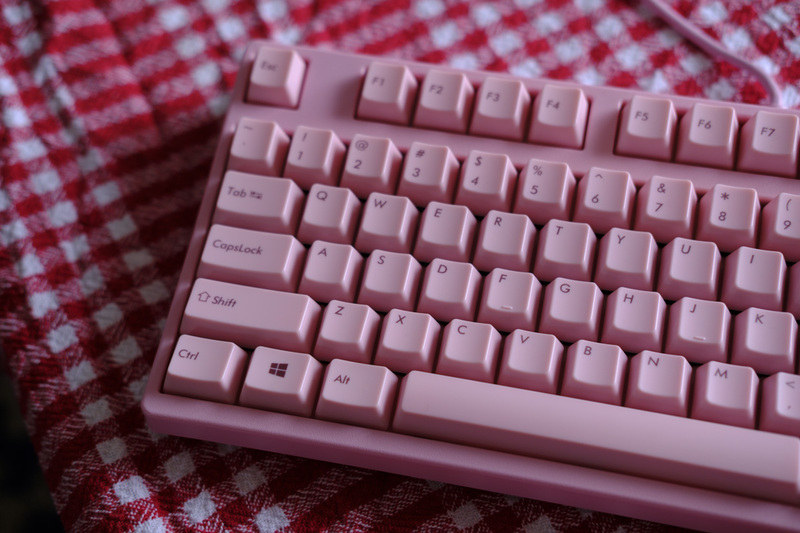 Looking for other pink keyboards? Why not take a look at the Pink Topre Type Heaven or the Matias Bluetooth Aluminium Keyboard in Rose Gold? 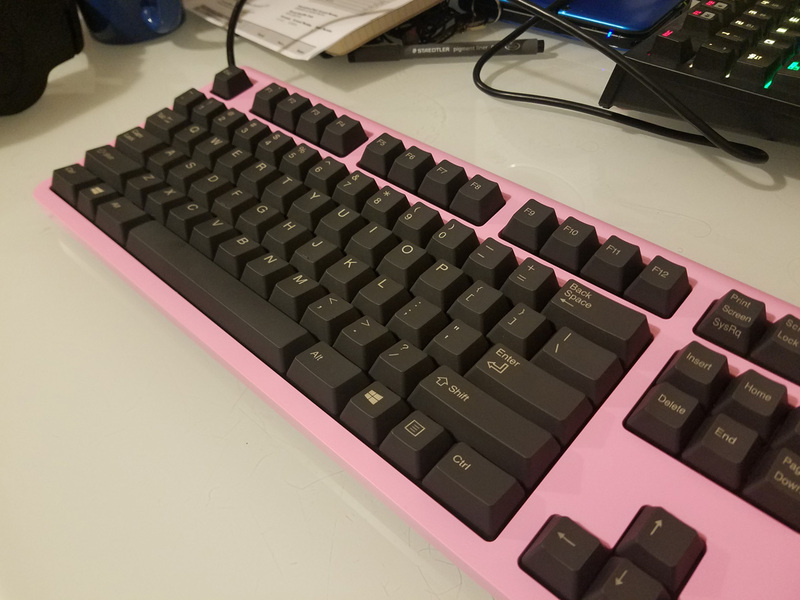 Thanks for checking out the article and be sure to let us know what you think of this keyboard in the comments below! Stay tuned for more keyboards, blogs and guides in the future by following us on Twitter or Facebook.